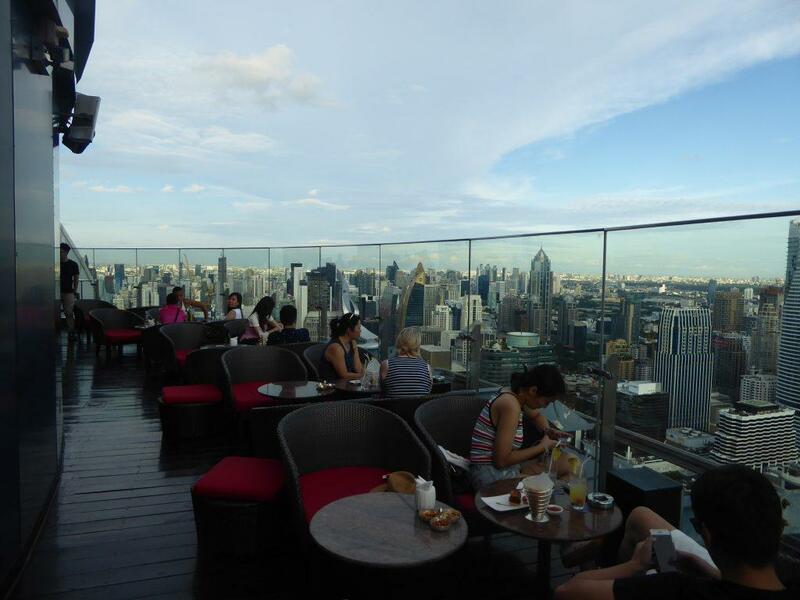 Bangkok has numerous rooftop bars mostly situated in hotels. Drinks can be expensive. Expect to pay between 200-400 baht for a small beer. Happy hours are the exception rather than the rule. 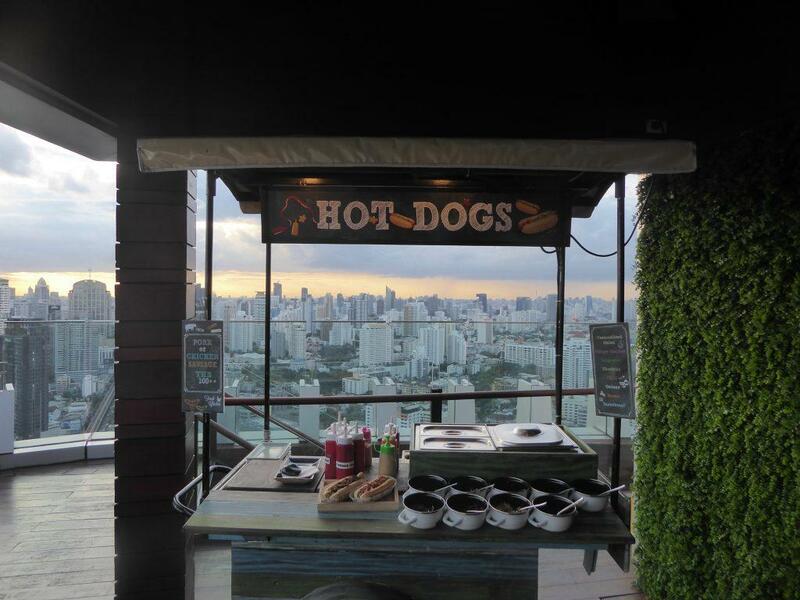 Most rooftop bars don’t serve food apart from a complimentary light snack such as peanuts or popcorn with your drink although most have attached alfresco restaurants on floors underneath the bar. 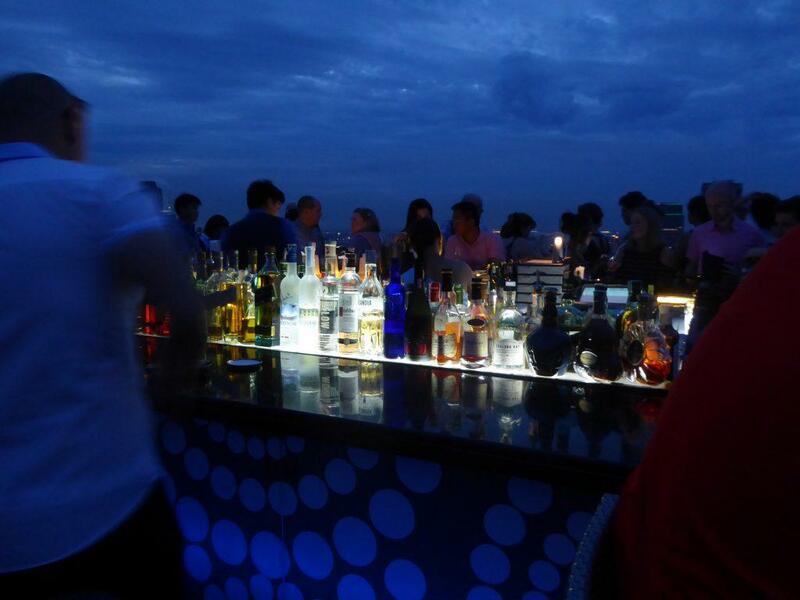 Some bars can be crowded around the sunset hours, particularly Sirocco, Moon Bar, Octave, and Red Sky. It’s advisable to either arrive early or try to reserve a table at these venues. 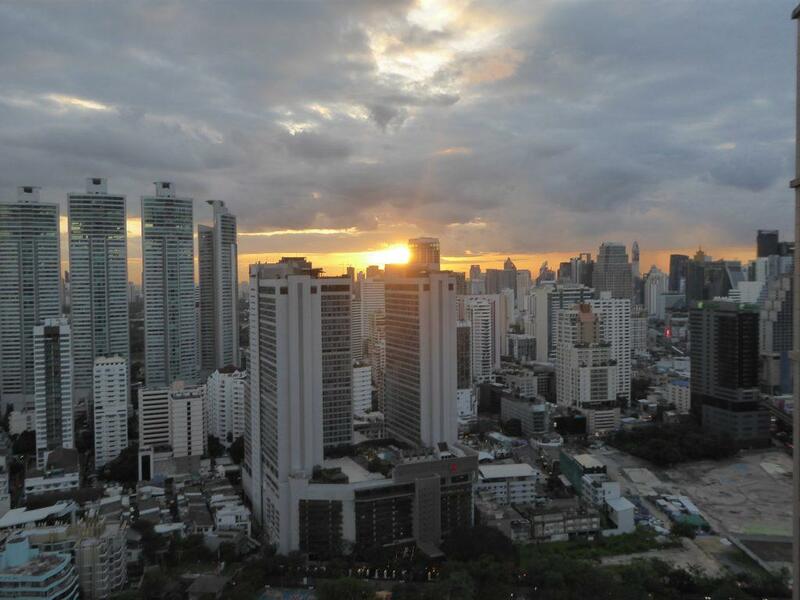 Bangkok sunset hours are between 18.00-19.00. 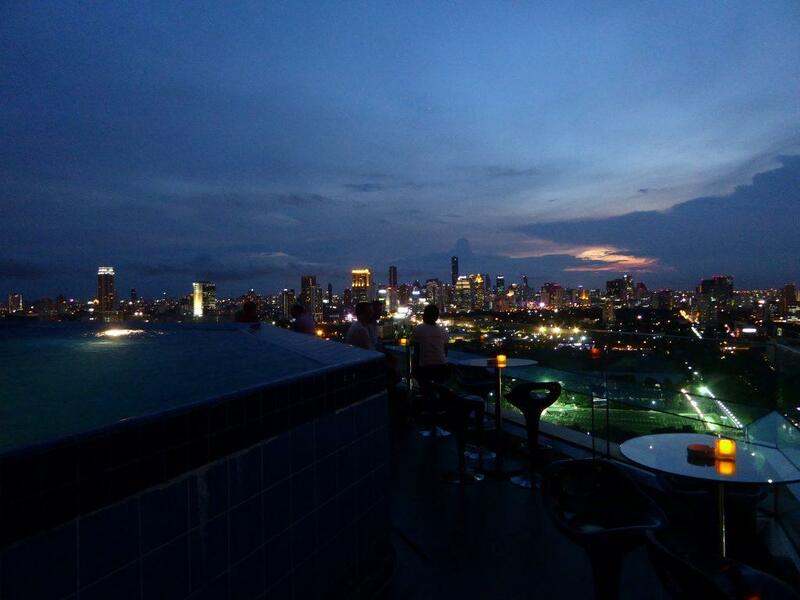 A sun-downer at a Bangkok rooftop bar should be a must do during your stay in Bangkok. Read on for the best places. 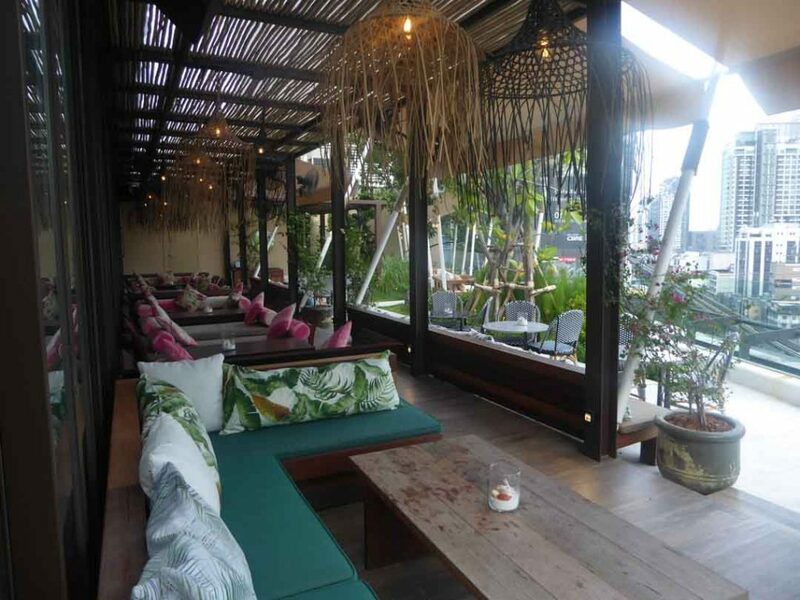 Escape is a beach style bar, club & bistro on the roof of the EmQuartier shopping mall. 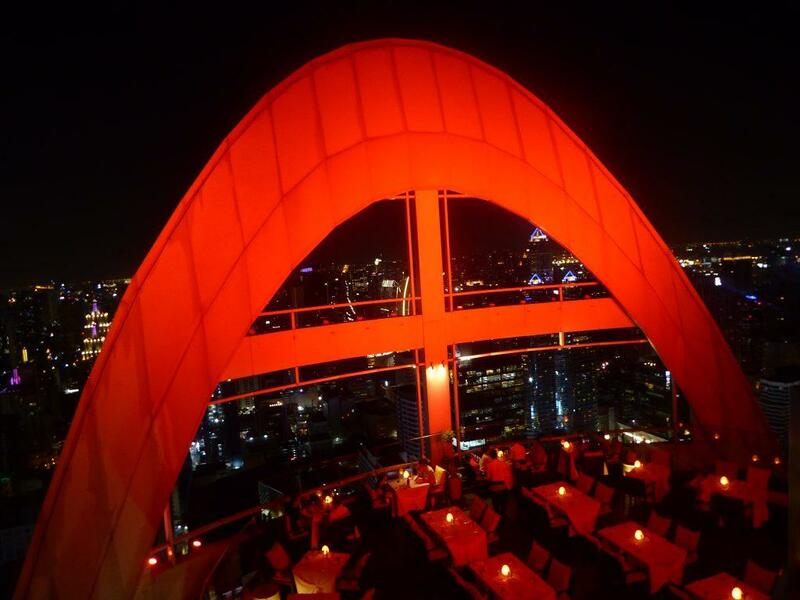 The bar is accessed from the malls 5th floor Helix Zone garden via the glass Vertigo bridge. The bar features four distinct zones each with its own personal bar. The Ellipse, a central oval-shaped bar with seating at and around the bar on sofa benches, The Sail is a bamboo-clad casual dining area with high stools, circular tables, and communal benches, The Tent, an air-conditioned tented zone, dimly lit with comfortable cosy seating, and The Terrace, a more private zone with comfortable sofas and a trio of thatched-roof cabanas overlooking the city below. The décor draws its inspiration from Bali, Mexico, and Marrakech. The music is tropical house, Jazz, Funk, and Soul. There are DJ’S and live accompanying performances from solo instrumentalists playing saxophone, violin or percussion. The DJ’s start at 17.30 with the live music after 20.00. There are weekly shows from International DJ’s. 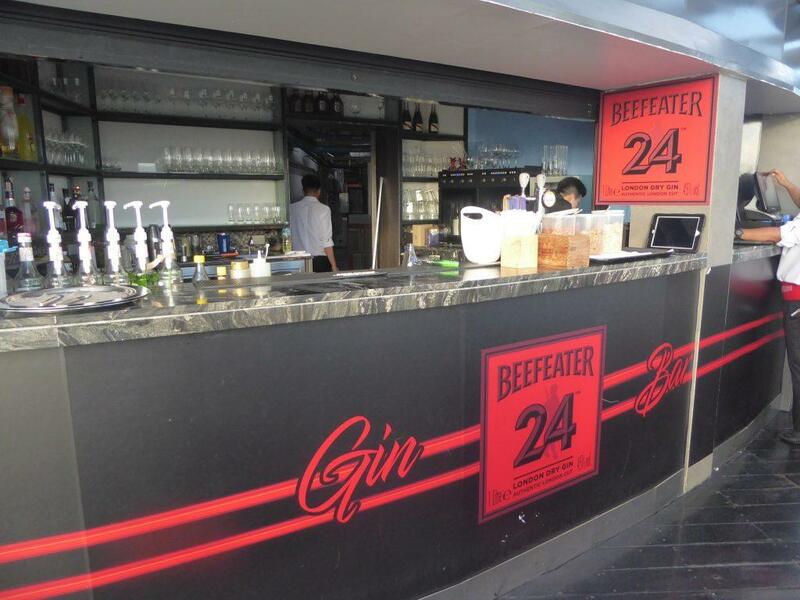 The bar serves cocktails, wine, champagne and a large selection of beers as well as soft drinks. There is a tapas menu, sharing boards and a full restaurant menu available in all zones. Tapas from 190 baht, mains from 390 baht, share boards at 990 baht, steaks from 1350 baht, seafood platters at 3500 baht and a selection of desserts from 180 baht. A service charge of 10% and VAT at 7% is added to the bill. Check the menu: http://www.escape-bangkok.com/Reservations can be made online at the website or by phone at 022586513. Reservations are essential on weekends. Address: 5th Floor, Helix Zone, EmQuartier, 651/1 Sukhumvit Road, Bangkok. Getting There: BTS Phrom Phong Station (exit 1). 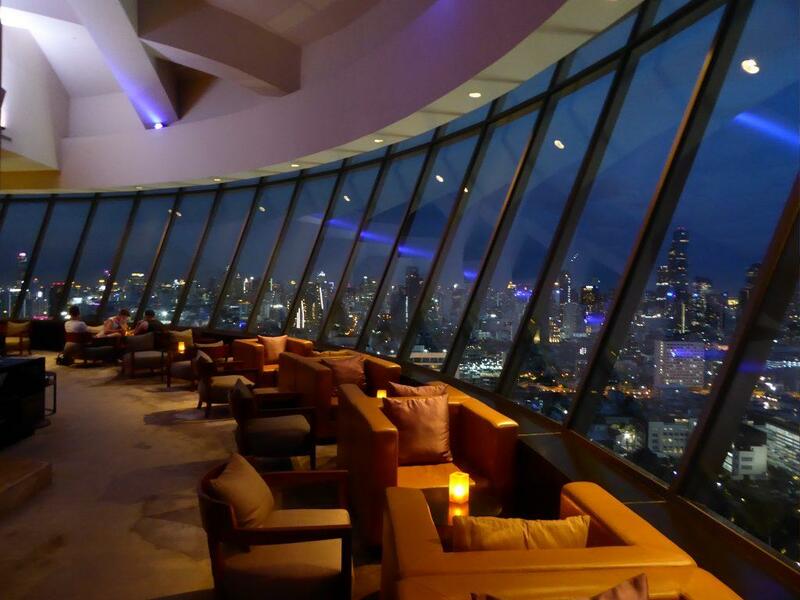 The Moon Bar & Vertigo Restaurant are located on the 61st-floor rooftop of the Banyan Tree Hotel on South Sathorn Road near Silom. 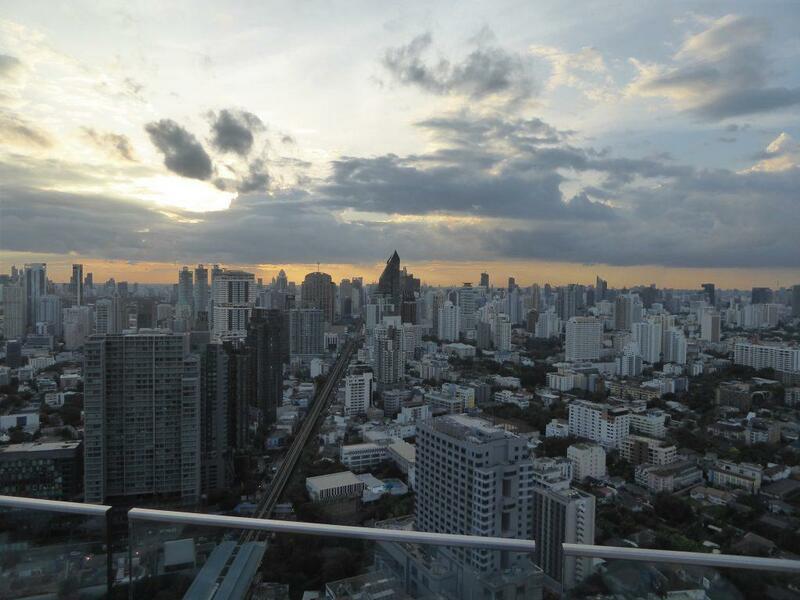 There are stunning 360-degree views of the surrounding Bangkok cityscape making it a great place to watch the sunset. The best time to arrive is 30 minutes before sunset so you can take in daylight, sunset and the glittering nighttime panorama of the city. 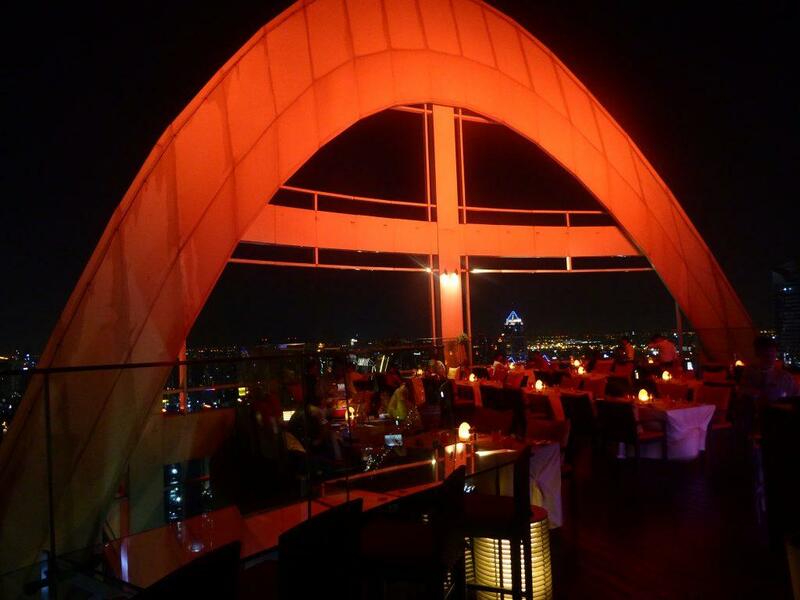 The rooftop houses both the Moon Bar where you can sip a beer or cocktail served with a small tapas dish and the Vertigo Restaurant where you can dine under the stars. Arrive early if you want a table at the bar as it is usually crowded by sunset with only standing room at the bar or make a reservation if you want a table at the restaurant. You must request a table at the edge if you want to dine at a table with an unobstructed view. Neither the bar or restaurant are cheap. At the Moon Bar a small beer will cost you 400 baht, and a cocktail 600 baht. 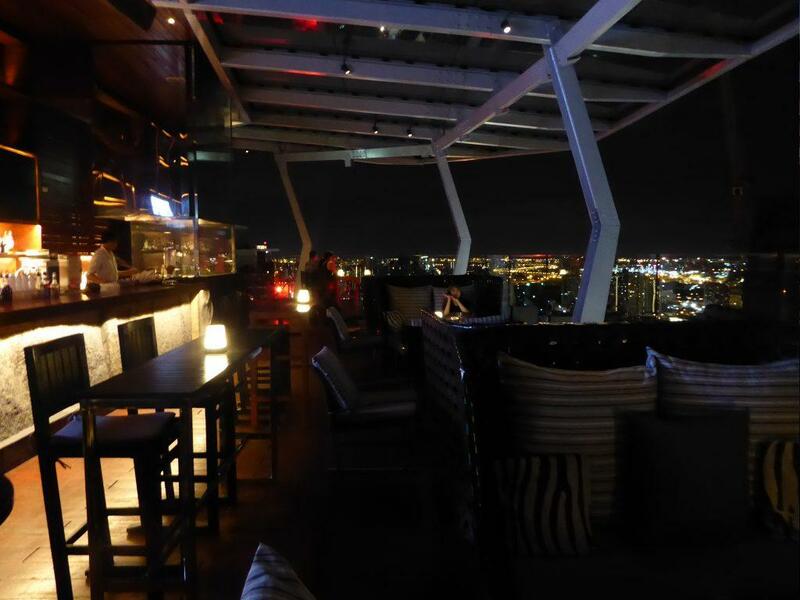 A meal for 2 with drinks at Vertigo will cost from 6000-12000 baht. Tax & service (17%) are added to the bill. There is a dress code so be sure to dress smartly. The crowd is mostly tourists. Service is efficient, friendly and polite and photography is permitted. Location: Banyan Tree Hotel, South Sathorn Road. Bangkok. Dress Code: Smart Casual (no flip-flops, shorts, singlets, athletic gear, backpacks). 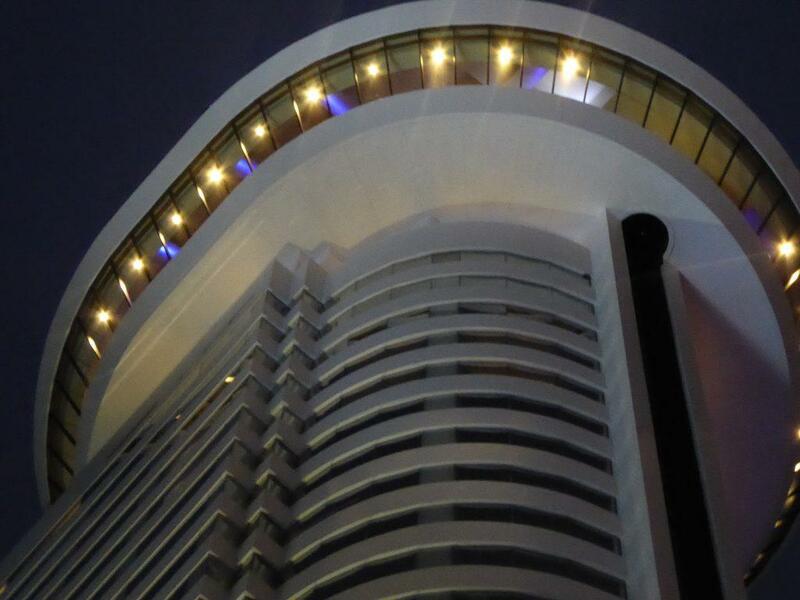 Opening Hours: Moon Bar 17.00-01.00, Vertigo Restaurant 18.00-10.30. BTS Sala Daeng (exit 4). Turn right into Soi Sala Daeng, continue to Sathorn Road, Cross the pedestrian bridge turn left and the Banyan Tree is 100m on your right. MRT Si Lom (exit 2). Turn left into Soi Sala Daeng, continue to Sathorn Road, Cross the pedestrian bridge turn left and the Banyan Tree is 100m on your right. 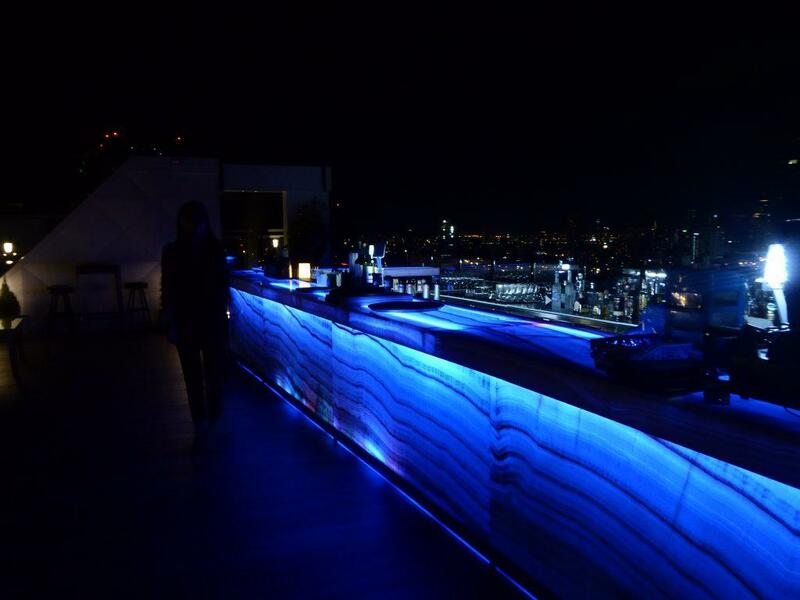 The Sky Bar is located on the 63rd floor of the Lebua Hotel on Silom Road. It is the highest open-air bar in the world but it’s the main claim to fame is its appearance in the film Hangover 2. The film inspired the bar’s hangovertini cocktail (a blend of green tea liquor, apple juice, Martini Rosso & rosemary honey). 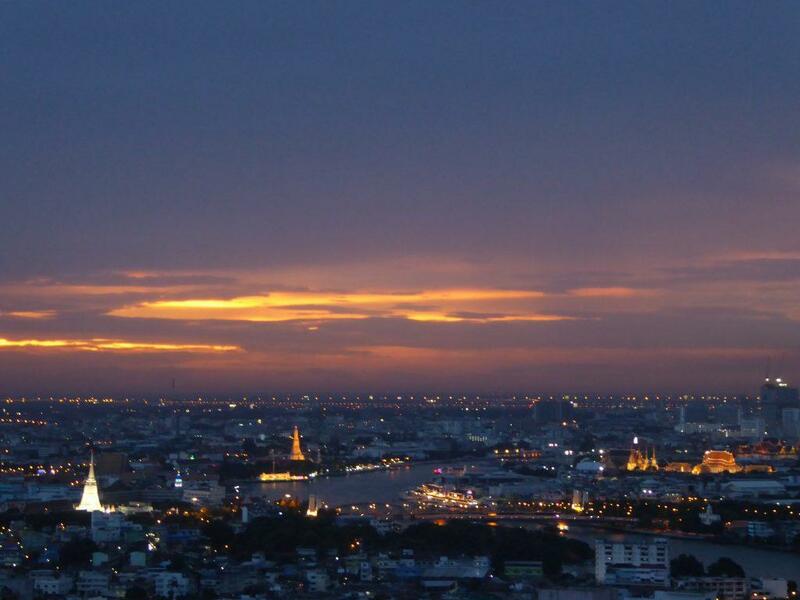 There are great views of the Chao Phraya river and the surrounding city. 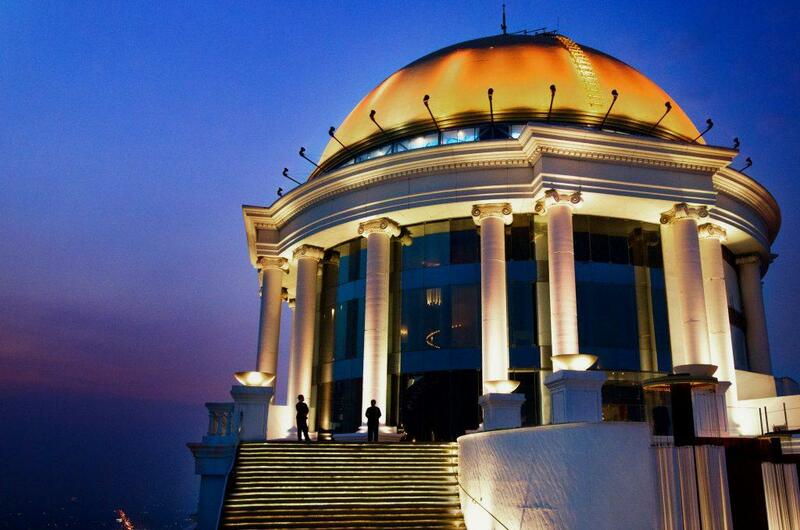 There is also an adjoining rooftop restaurant Sirocco. 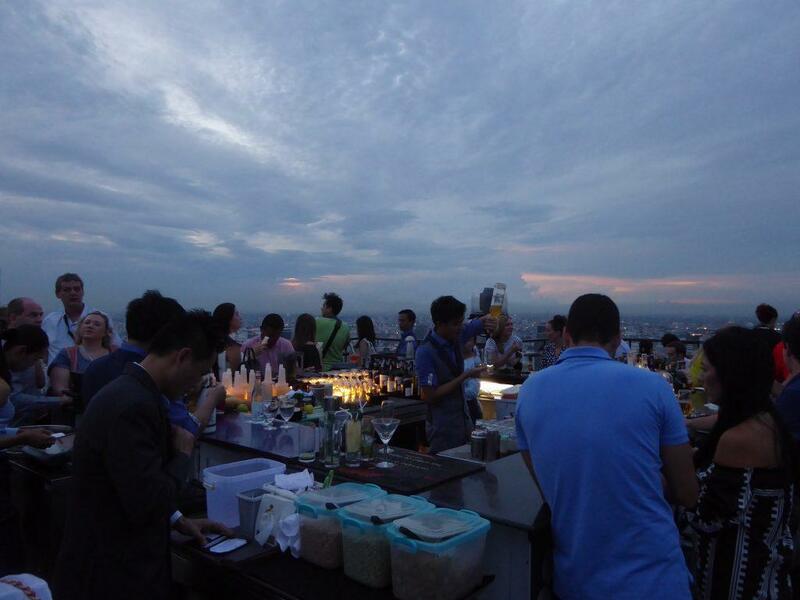 The Sky Bar is very popular and it sometimes feels more like a tourist attraction than a bar. If you want to avoid the crowds get there early as the small bar area soon fills up. Drinks are expensive at 500 baht for a small beer and 700-1000 baht for cocktails. Tax & service (17%) are added to the bill. There is a very strict dress code requiring long trousers, long-sleeved shirts, and proper shoes and is strictly enforced. Photography is permitted only in certain areas. Children over 7 years old are welcome if accompanied by an adult though they must observe the same dress code as adults. 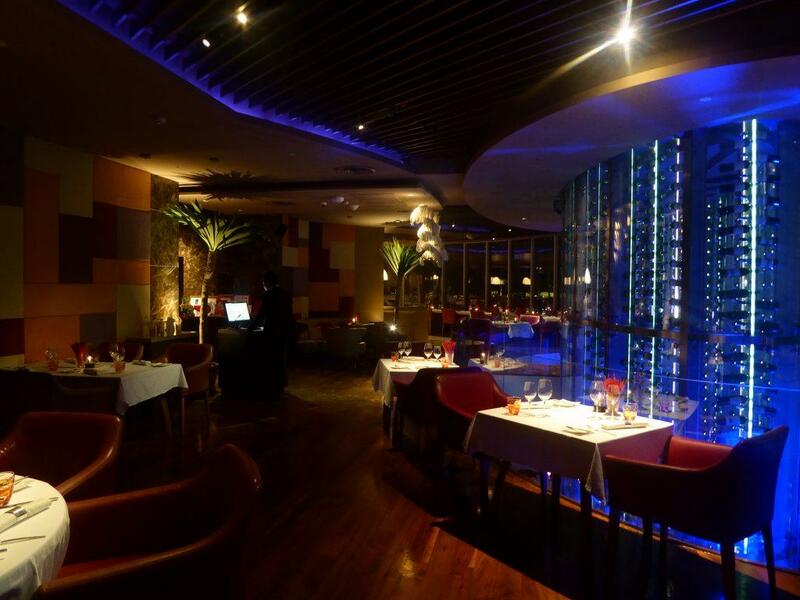 Sirocco Restaurant offers a Mediterranean inspired menu and is an amazingly romantic dinner location, but at a price. Expect to pay 13000-20000 for a meal for two with drinks. That could be almost as much as the cost of your flight to Bangkok. If you want to dine you will need to make a reservation which can be done online. 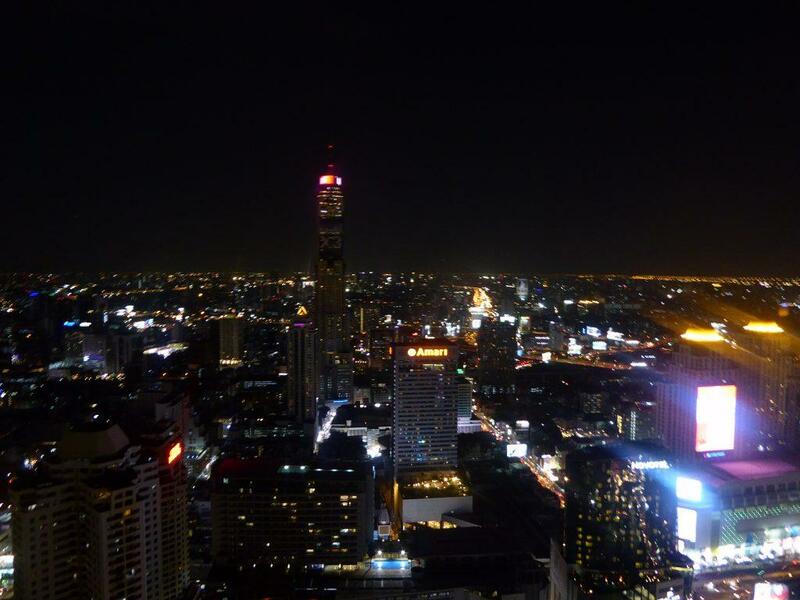 Location: 63rd-floor Lebua Hotel, State Tower, Silom Road, Bangkok. Dress Code: Smart Casual (no flip-flops, shorts, singlets, athletic/sports gear, sleeveless clothing, backpacks). BTS Saphan Taksin (exit 3). Turn left onto Charoen Krung Road. Turn right into Silom Road and Lebua is on your right. BTS Sala Daeng (exit 4). Take a taxi down Silom Road. MRT Si Lom (exit 2). Take a taxi down Silom Road. 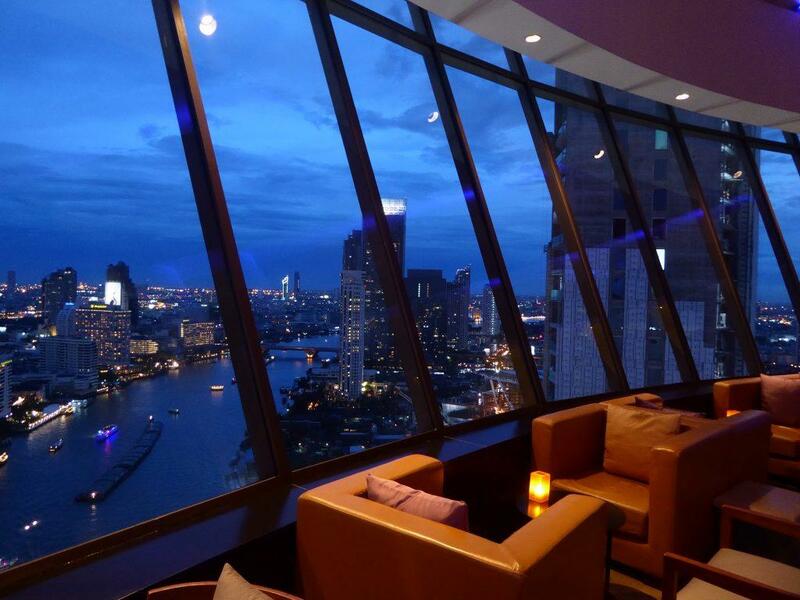 The 360 bar occupies a stunning riverside location on the 32nd floor of the Millennium Hilton Hotel with great views along the Chao Phraya river below with its constant traffic of boats. 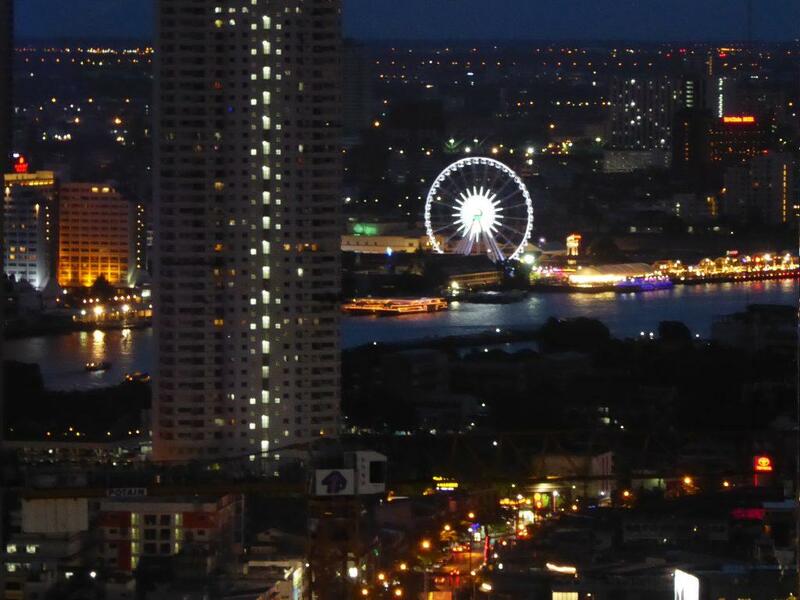 Opposite is the Chinatown district with Wat Traimit, River City, and the Sheraton Hotel. 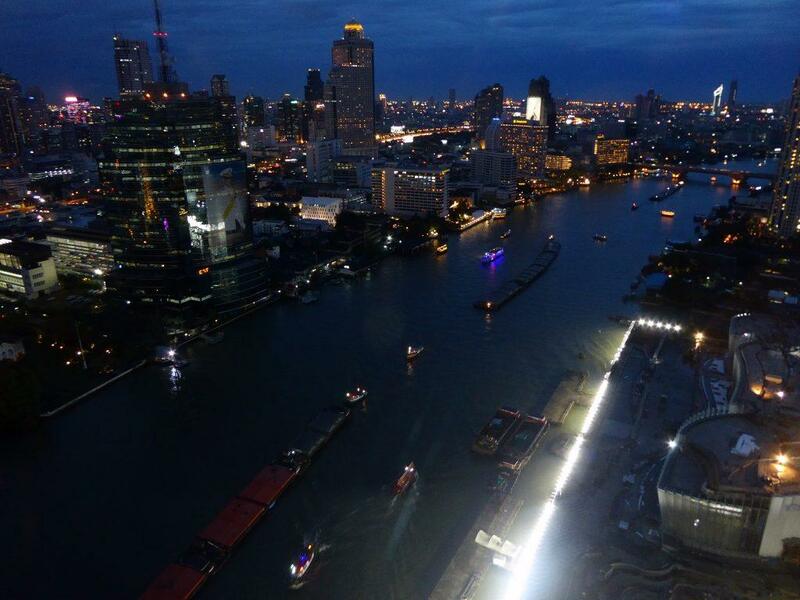 Further up river you can glimpse Wat Arun, Wat Saket, The Grand Palace, Wat Prayoon, Memorial Bridge and Asiatique all visible in the distance and lit up at night. 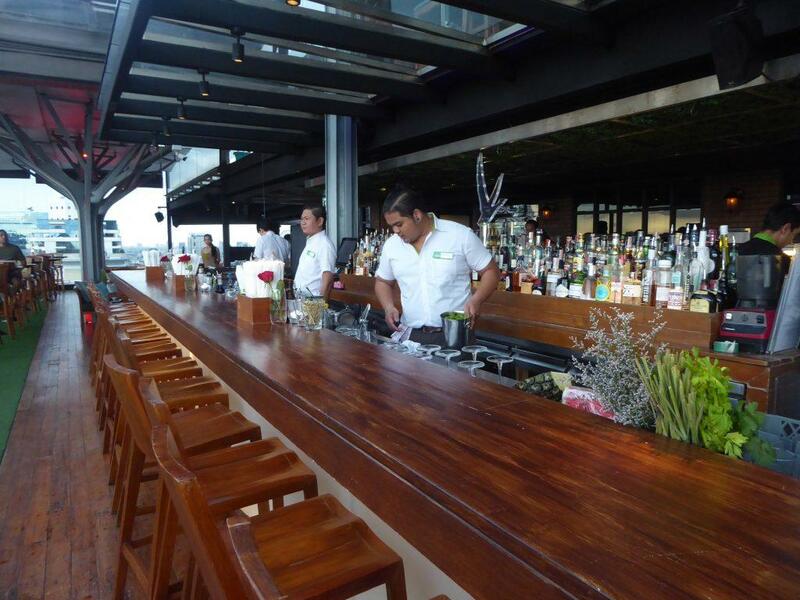 The bar consists of a river facing outdoor seated terrace and an indoor air-conditioned lounge. A stairway leads up from the lounge to a distinctive round glass enclosed cupola lounge with a 360-degree panoramic view of the surrounding area. There is comfortable seating all around the edge of the cupola and live Jazz music after 21.00. The sun sets at the back of the hotel. Prices are average for an upmarket hotel with beers starting at 250 baht, cocktails from 360 baht and wine at 500 baht a glass. Tax and service (17%) are added to your bill. A snack menu is also available as well as a light buffet. Service is efficient and friendly. The dress code is smart casual officially meaning no shorts, singlets or flip flops but this is sometimes overlooked. 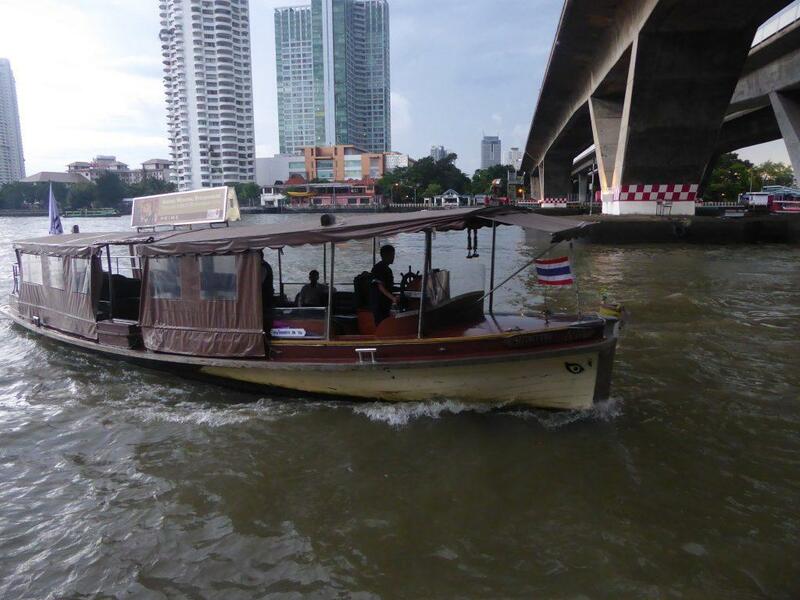 There is a free shuttle boat from the hotel boat pier at Sathorn Pier next to Saphan Taksin BTS. There is a second hotel shuttle boat that runs between the hotel and Asiatique. 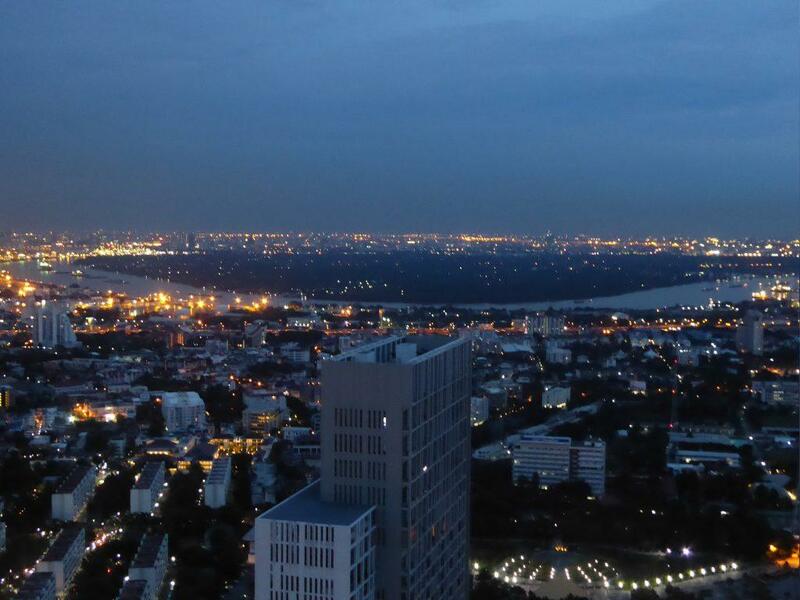 Location: 32nd floor, Millennium Hilton Hotel, 123 Charoennakorn Road, Bangkok. 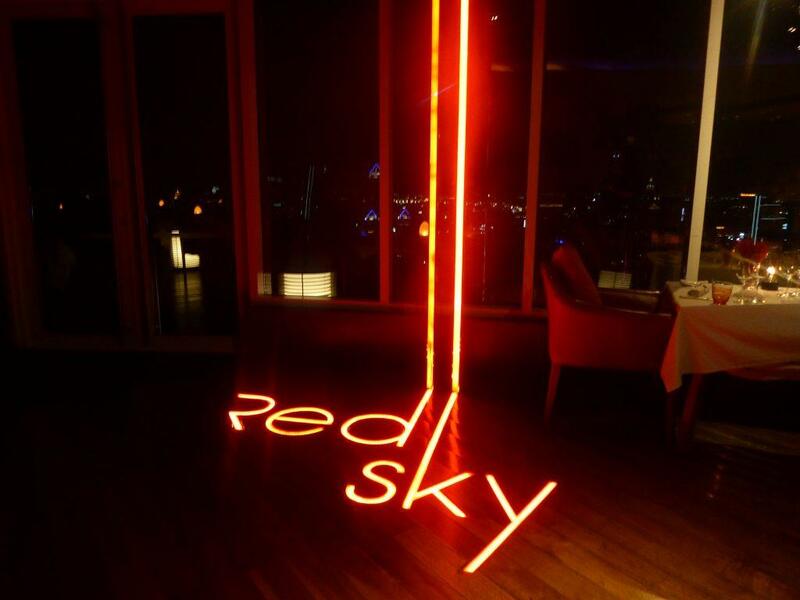 Red Sky is a rooftop bar and restaurant on the 56th floor of the Centara Grand Hotel attached to Central World Mall in the downtown Ratchaprasong shopping district. There is a 360-degree panoramic view of the surrounding city. Its outstanding feature is a large glowing arch which constantly rotates color between pink, red, purple, yellow, green and blue. The bar is spread over three floors with an indoor air-conditioned dining room and outdoor dining area, a 360 degree round open air seated bar and an exclusive al fresco Cru Champagne bar on the top floor which you must have a reservation to access with the menu devoted to champagne by the bottle and champagne cocktails only and featuring live Jazz music. The lower level is for dining only with indoor and outdoor sections as well as another indoor bar. The menu is European cuisine. Main courses range from 500 baht up to 5000 baht. A meal for two here with wine will set you back around 10000 baht. The middle floor has drink service only with free snacks. 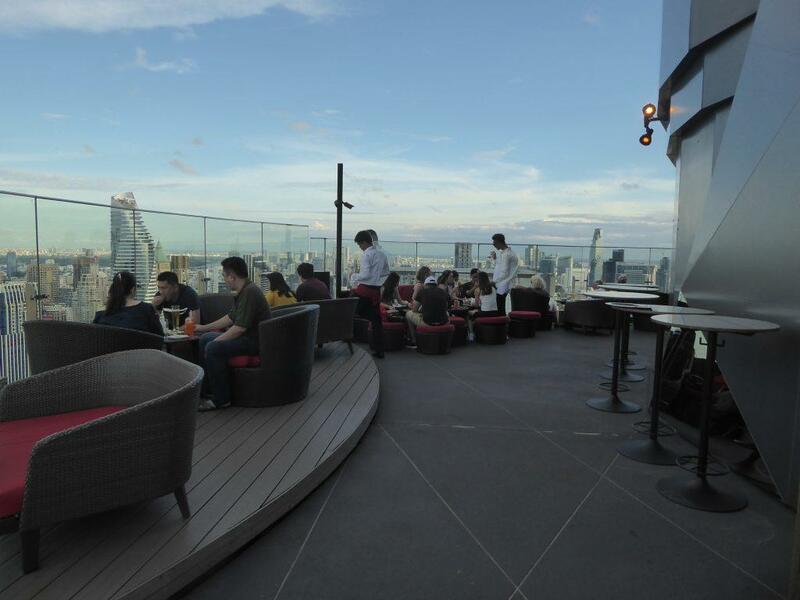 Drinks are usual rooftop bar prices with beers from 320 baht, Spirits from 320 baht, Cocktails from 430 baht, Mocktails from 260 baht and soft drinks from 180 baht. Service and VAT (17%) are added to all bills. There is a daily happy hour from 16.00-18.00 where all drinks are buy one get one free. Giant cocktails have their own happy hour from 18.00-20.00. There is a live DJ from 20.00. Service is efficient and friendly with staff who speak good English. The dress code is smart casual – no shorts, singlets or flip-flops. The entrance to Red Sky is from the lobby of the Centara Grand Hotel though there are connecting lifts in the car park via the 4th floor of Central World. 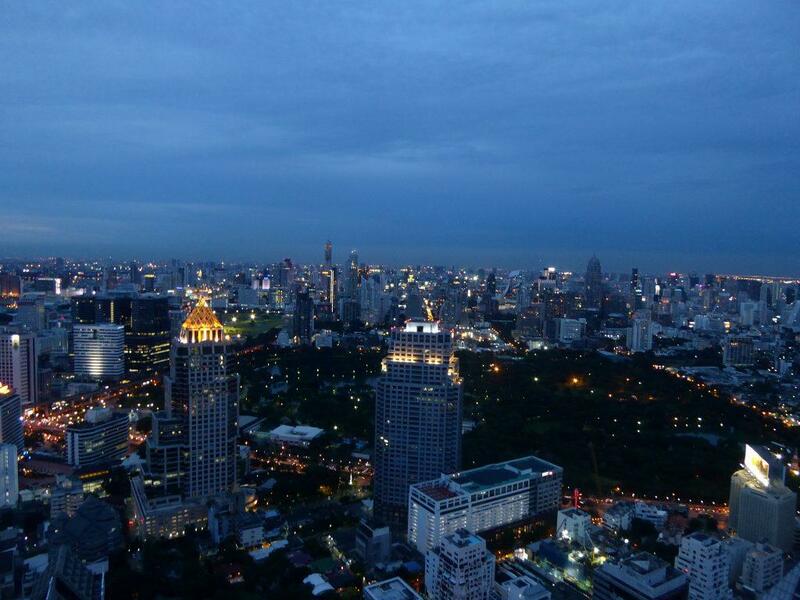 Location: 56th floor, Centara Grand Hotel, Central World Mall, Bangkok. Getting There: BTS Siam (exit 5) or Chit Lom (exit 6) stations, then take the elevated walkway to Central World. 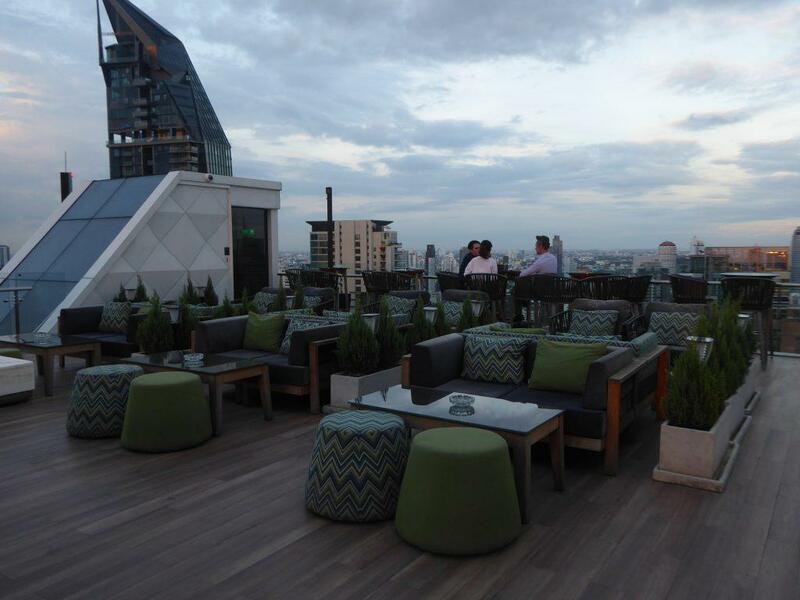 Octave is a rooftop lounge and bar on floors 45-49 of the Marriott Sukhumvit. 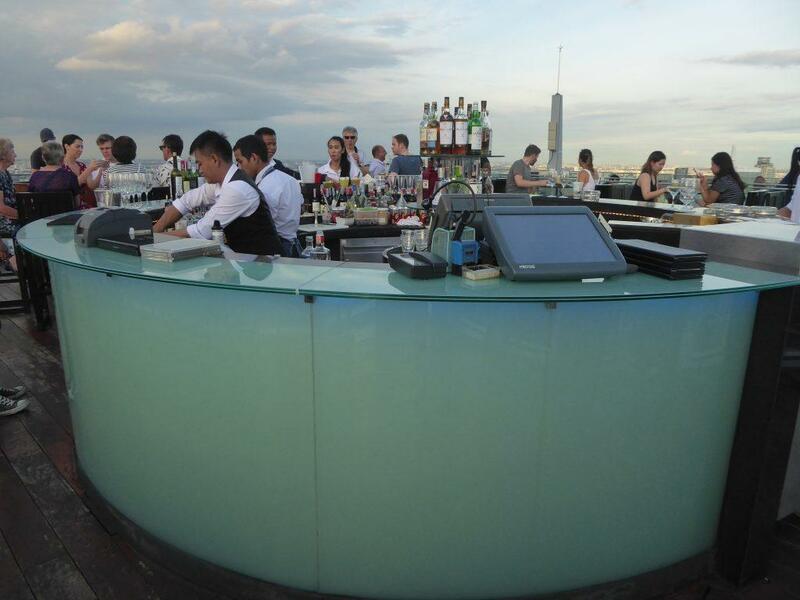 The bar has 360-degree panoramic views of the city. 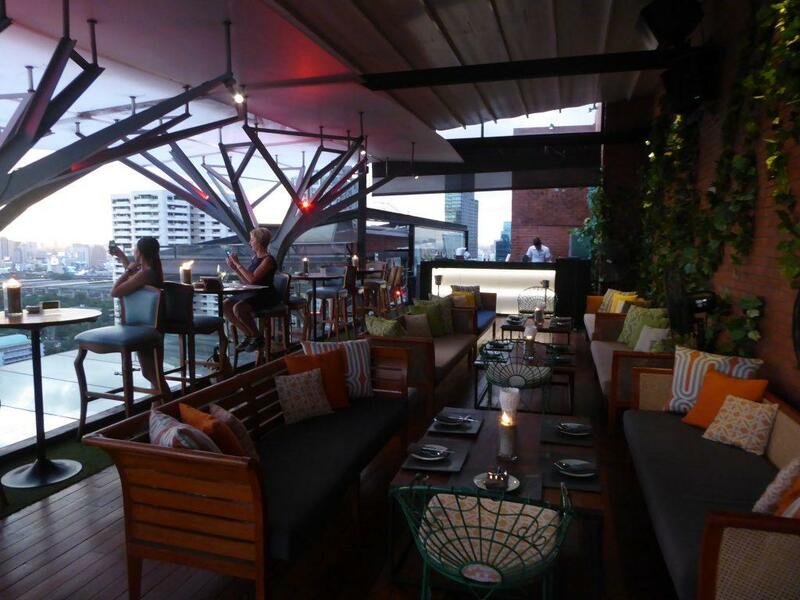 The rooftop is alfresco while the floors below have indoor air-conditioned dining spaces, a private room and an outdoor terrace with a retractable cover. 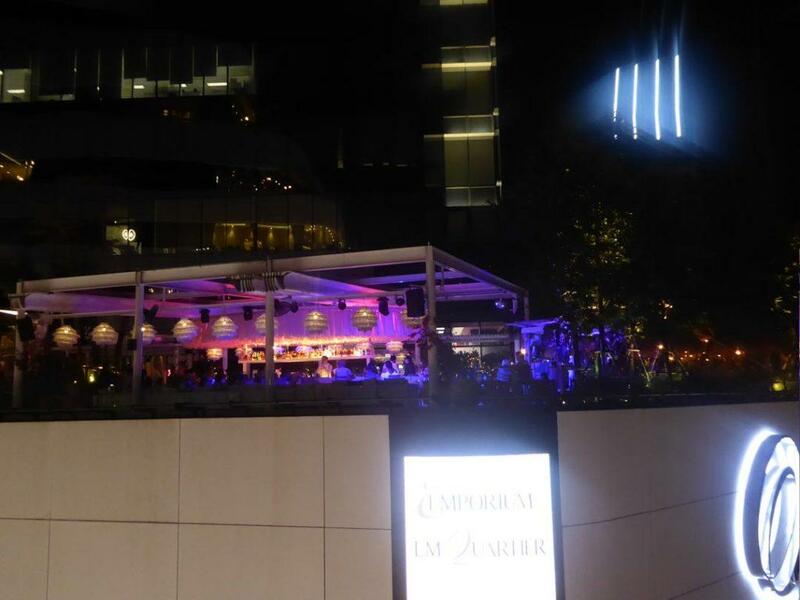 There are DJ’s on the rooftop and outdoor terrace. 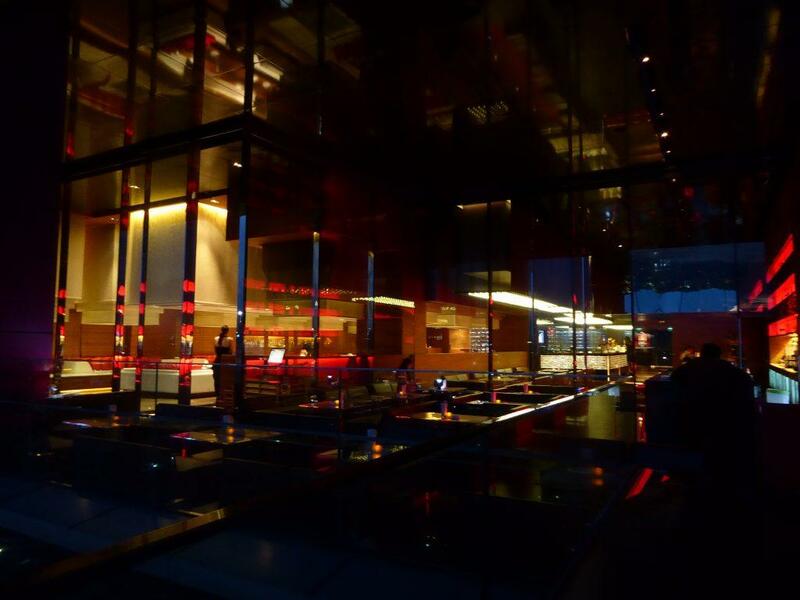 The menu in the restaurant is new age fusion style tapas with the emphasis on Asian cuisine. There are seafood and sushi bars as well as a snack menu and a hot dog stand. Bar snacks are served with a drink on the roof. Dishes cost from 170 baht to 990 baht. Hot dogs are 100 baht. Drinks are the usual rooftop prices with beers from 250 baht, Cocktails from 330 baht, Spirits from 350 baht, Mocktails from 250 baht, Soft drinks from 110 baht and Champagne from 7500 baht a bottle. Service & tax (17%) are added to all bills. There is a happy hour between 17.00-19.00 with a 50% discount on signature cocktails. The dress code is smart casual – no shorts, singlets or flip-flops. You must be at least 20 years old to enter Octave. You may be asked for ID. The Marriott is a short walk from BTS Thon Lo station. 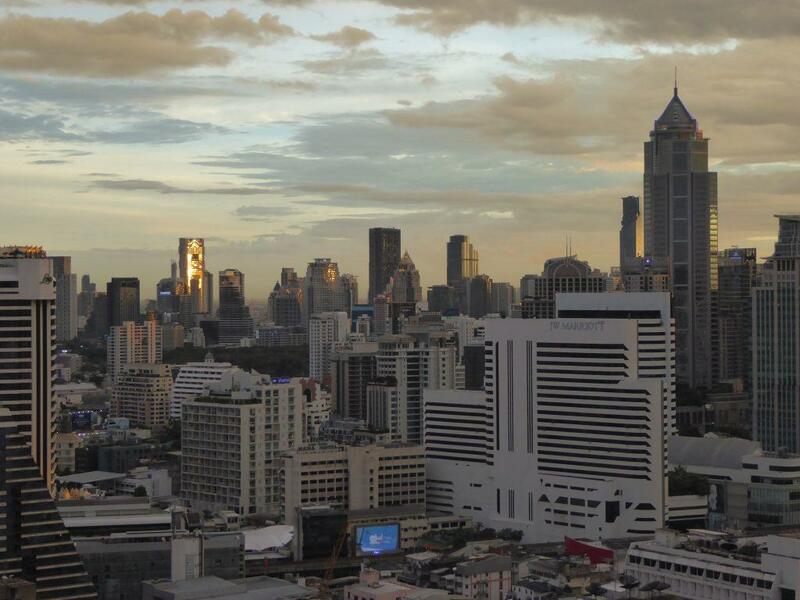 Location: 45-49th floors, Marriott Sukhumvit Hotel, Sukhumvit Soi 57, Bangkok. Getting There: BTS Thong Lo Station (exit 3). Cross the intersection and the Marriott is on your left at the entrance to Soi 57. 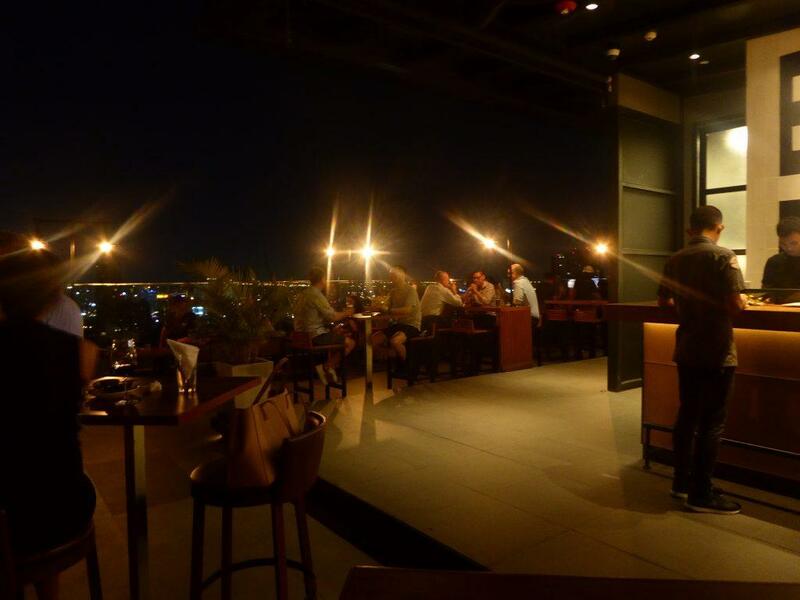 Long Table is a chic bar-restaurant on the 25th floor of the Column Tower a short walk from the Asoke intersection on Sukhumvit road. 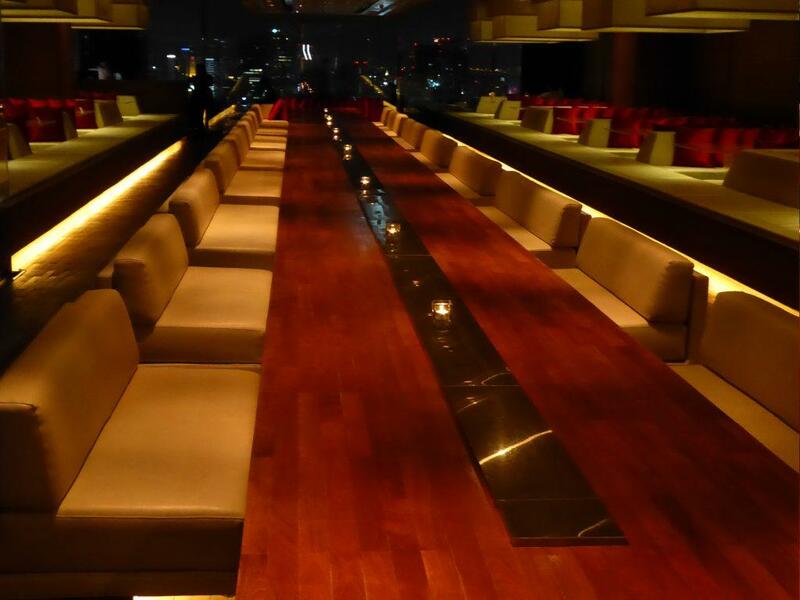 It is famous for its 25m long table which seats 70 people and runs the length of the restaurant. 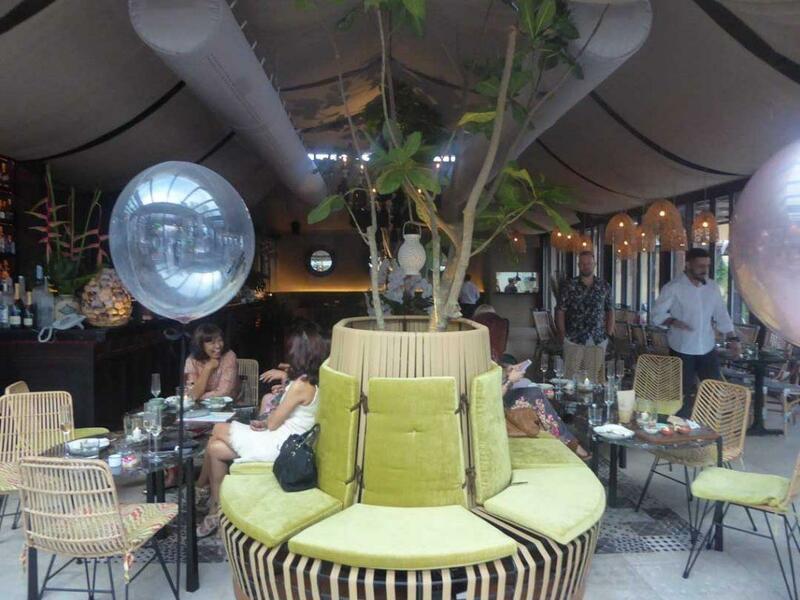 The interior design is modern and stylish with comfortable sofa style seating in booths and around the long table. The lighting is minimal red and orange with candlelit tables adding a romantic touch. 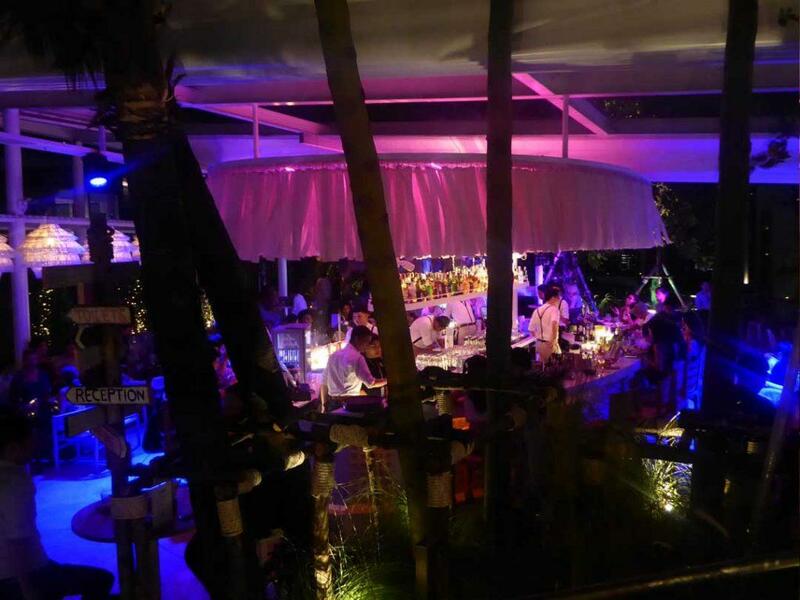 There is an outside terrace with tables arranged around an underwater lit swimming pool, though the pool is not for the use of restaurant customers. 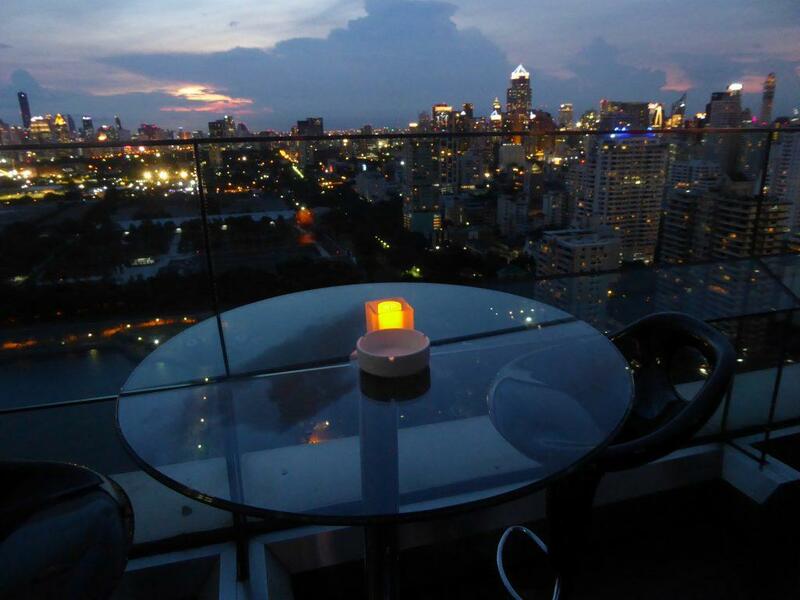 The outside terrace has great views of the sunset and the surrounding city. There is a daily buy one get one happy hour between 17.00-19.00 with a free snack included making it a good venue for sunset drinks. 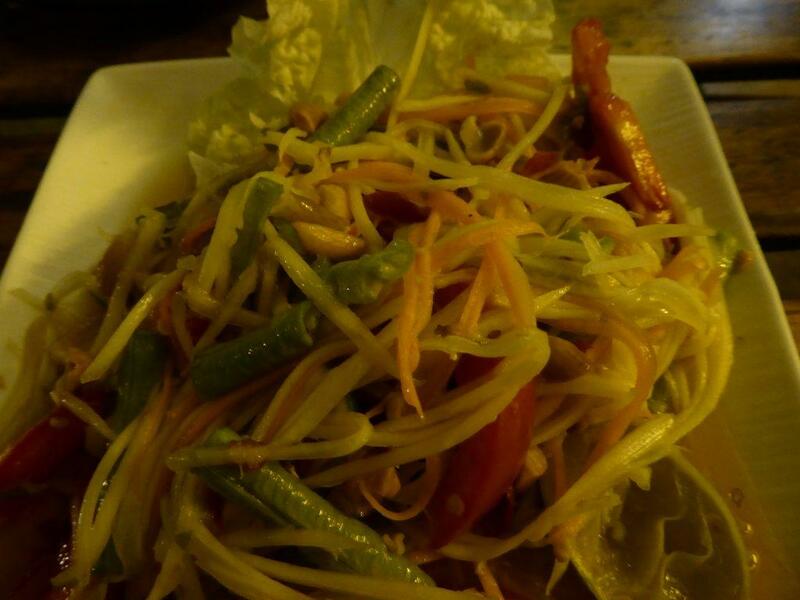 The restaurant serves up quality International-Thai fusion food at reasonable prices running from 100-250 baht for appetizers and salads and 350 baht upwards for mains. Drinks start at 200 baht for a small beer and from 300 baht for cocktails. Tax and service (17%) are added to all bills. The dim lighting makes it hard to read the menu, though the service staff has torches for your use. The crowd are a mixture of locals, expats, and tourists and strictly enforces a smart casual dress code. Long Table is a short walk from the BTS & MRT stations at the Asoke/Sukhumvit intersection and is easily located due to its huge neon sign on the outside of the Column Tower. Location: Floor 25, The Column Tower, Sukhumvit Road Soi 16, Bangkok. Dress Code: Smart Casual (no flip-flops, shorts, singlets, athletic gear). Getting There: BTS Asoke (exit 4), MRT Sukhumvit (exit 2). 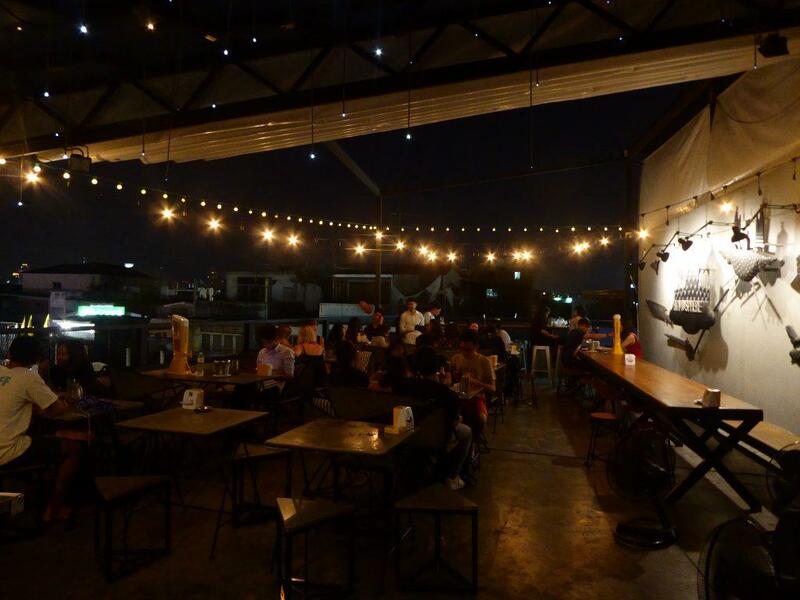 Brewski is a rooftop bar specializing in craft beer. 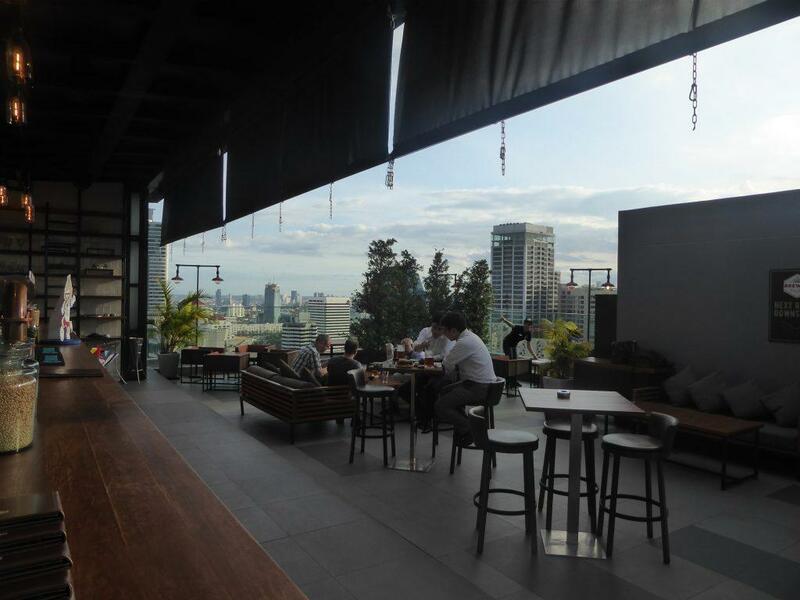 It’s located on the 30th floor of the Radisson Blu hotel on Sukhumvit Road near Soi 27. There are 12 beers on tap which rotate regularly, 11 of which can be described as a craft beer. One tap is reserved for a cheaper ordinary domestic brew. There are also over 100 bottled craft beers and ciders. Prices range from 180 baht a pint for the domestic brew up to 350 baht a pint for the craft beers. There is also a food menu from 120 baht for snacks up to 490 baht for a burger and fries. There is comfortable sofa seating as well as high tables and balcony high stools with great views of the surrounding city. Service is efficient and friendly. There is a DJ from Thursday to Sunday playing house and EDM. The dress code is smart casual – no shorts, singlets or flip-flops. You must be at least 20 years old to drink at Brewski. ID may be asked for. 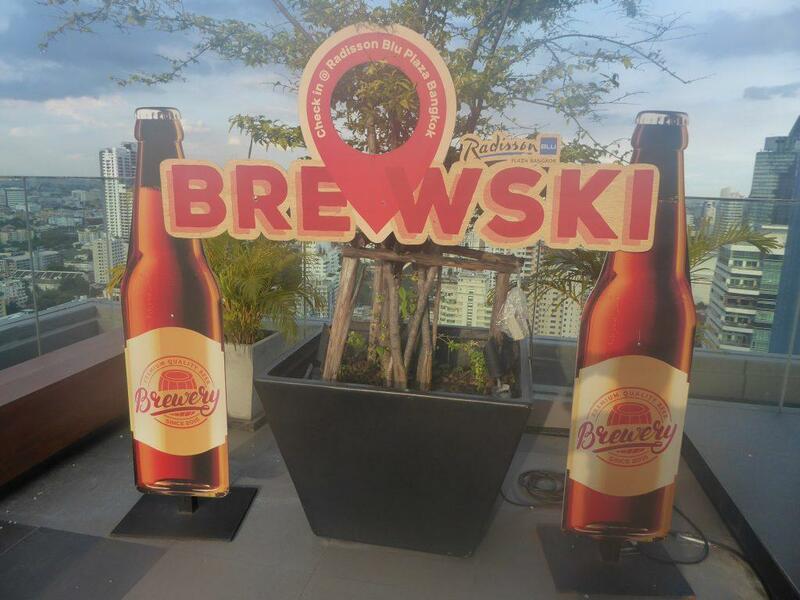 Brewski is a short walk from BTS Asoke and MRT Sukhumvit stations. Location: 30th floor, Radisson Blu Hotel, 489 Sukhumvit Road (Soi 27), Bangkok. Opening Hours: 17.00-01.00 Sunday-Thursday, 15.00-01.00 Friday-Saturday. Getting There: BTS Asoke station (exit 6). Cross the intersection and walk up Sukhumvit Road. The Radisson is on your left. MRT Sukhumvit station (exit 2). Take a left and walk up Sukhumvit Road. The Radisson is on your left. 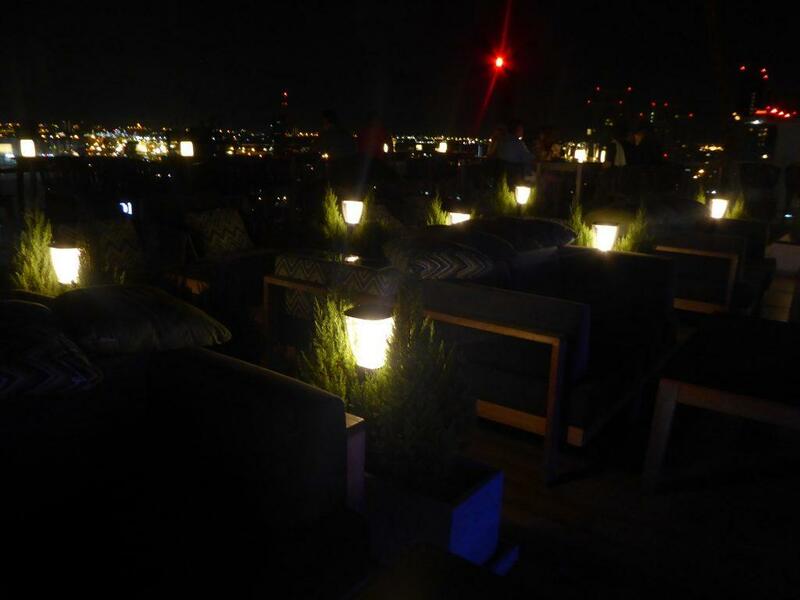 Above 11 is a chic rooftop bar and restaurant on the 33rd floor of the Fraser Suites Hotel. 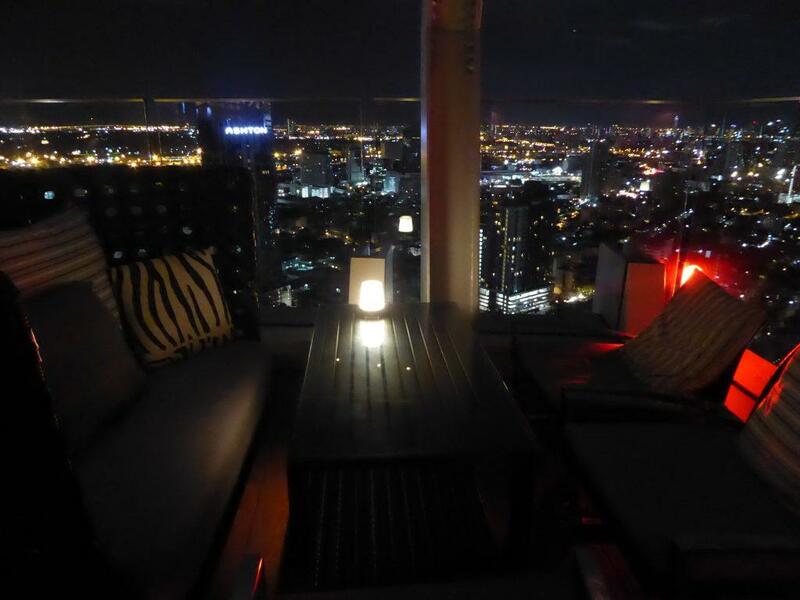 The bar overlooks busy Sukhumvit Soi 11 with stunning views of the Bangkok skyline. 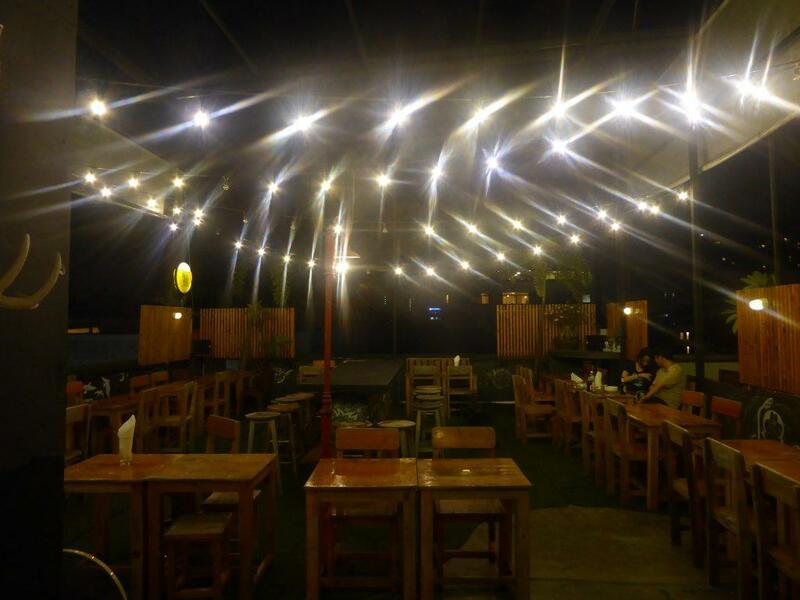 The bar has a relaxing garden style ambiance with trees, potted plants, and even some grassy areas. 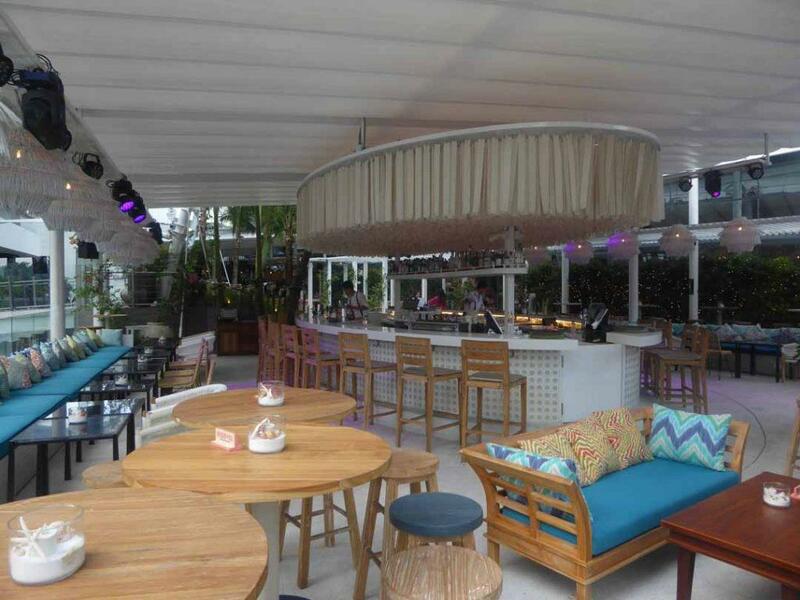 The seating features comfy sofas, balcony side tables and stools seating at the bar. There is also an upstairs balcony with more seating, it’s own bar and DJ. 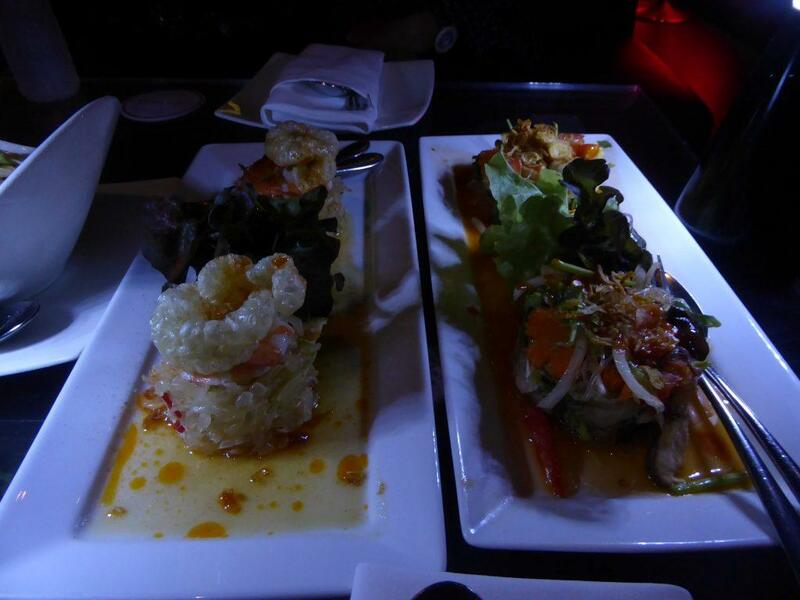 The restaurant serves quality authentic Peruvian Japanese cuisine. Prices range from 300 baht to 1100 baht with the average main costing 400-500 baht. There are also platters from 1200 baht to 1900 baht. 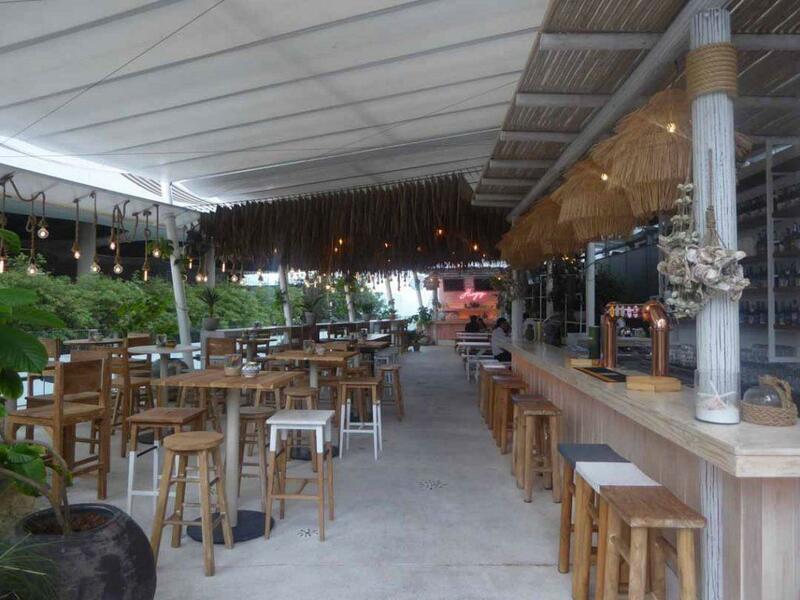 Drinks are reasonably priced for a rooftop bar with beers from 190 baht, spirits from 230 baht, cocktails from 320 baht, mocktails from 200 baht, soft drinks from 100 baht, wine from 310 a glass and from 1600 baht for a bottle. The bar has an interesting signature cocktail menu. All bills are subject to service and tax (17%). Above 11 has a modern rotating music menu with nightly DJ’s spinning disco, house, funk, hip-hop, soul, techno, salsa, and jazz from 21.30 to 02.00. There is also live music from 18.00 and regular live jazz performances. Wednesday is salsa night while Thursday is Jazz night. 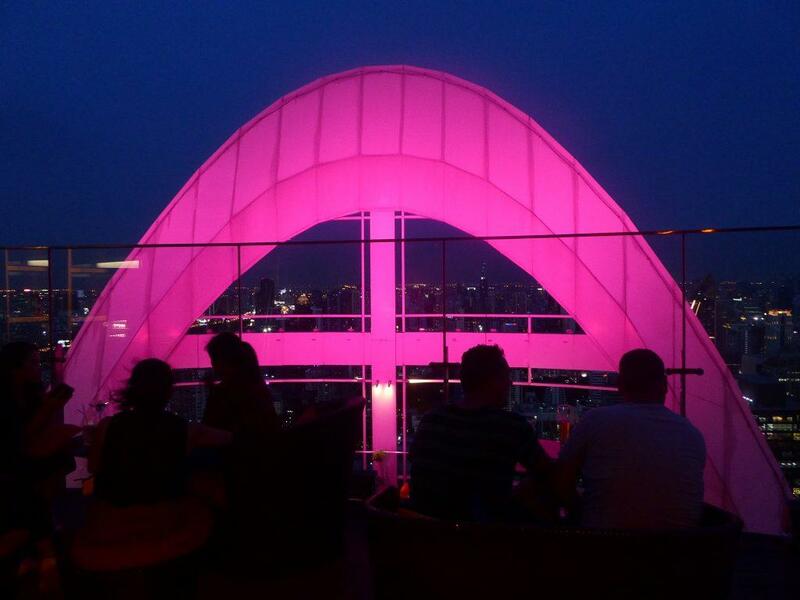 Above 11 is one of the nicest rooftop bars in Bangkok. The mood is informal, prices are reasonable, service is efficient and friendly. It’s popular but never too busy, unlike some other bars. There is a dress code of no singlets, flip-flops, backpacks or sports attire. Access to the bar is via an elevator at the back of the hotel. Location: 33-34 floor, Fraser Suites, Sukhumvit Road Soi 11, Bangkok. Getting There: BTS Nana Station (exit 3). Turn left into Soi 11. Fraser Suites is a 10 minute walk on your right or take a taxi or motorbike. 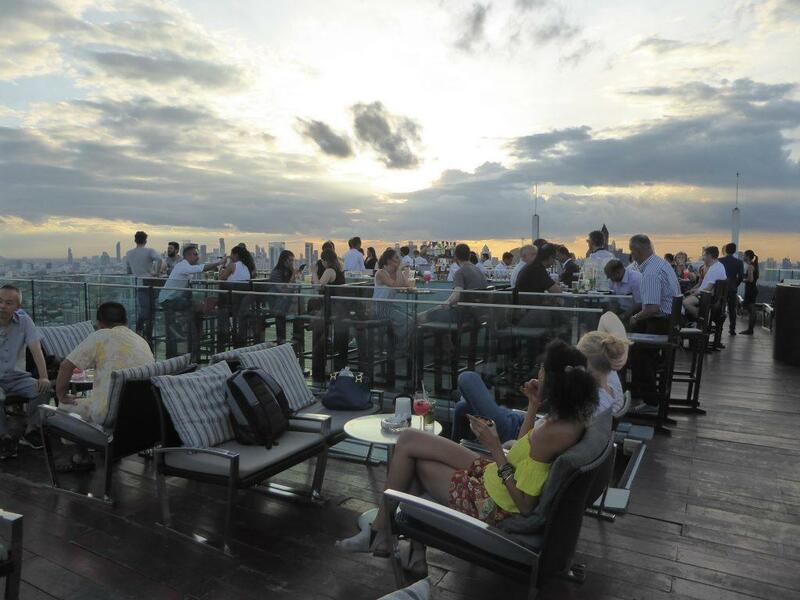 Vanilla Sky is a rooftop bar on the 36th floor of the Compass Sky View hotel on Sukhumvit Soi 24, a few minutes walk from Phrom Phong BTS and Emporium shopping mall. 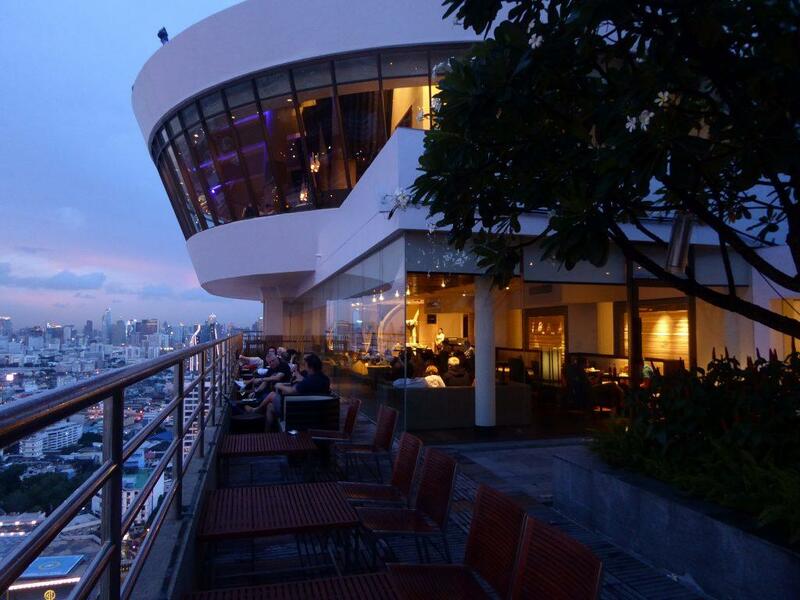 The bar has a 360-degree panoramic view of the Bangkok skyline and a great view of the adjoining Benjasiri park. The seating is arranged with comfortable sofas in the middle and high tables along the edge. There is a DJ after 21.00. 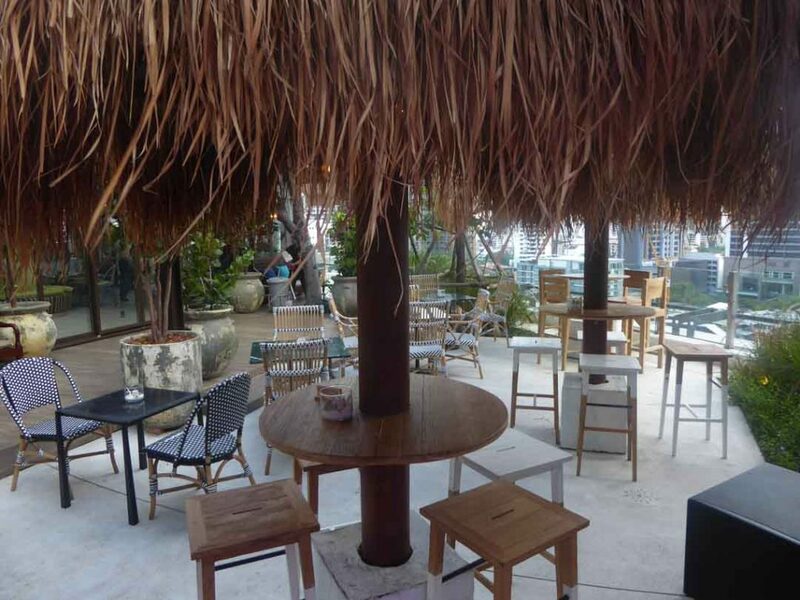 The drinks are standard rooftop prices with beers from 240 baht, cocktails from 320 baht, spirits from 340 baht, mocktails from 250 baht and soft drinks from 130 baht. There is no food menu but light snacks come with a drink. On the 35th floor is the Vanilla Night Club and on the 32nd floor is the Mojjo Lounge, a Cuban style bar and restaurant with an outdoor terrace serving Cuban inspired cocktails and Cuban platters and snacks. 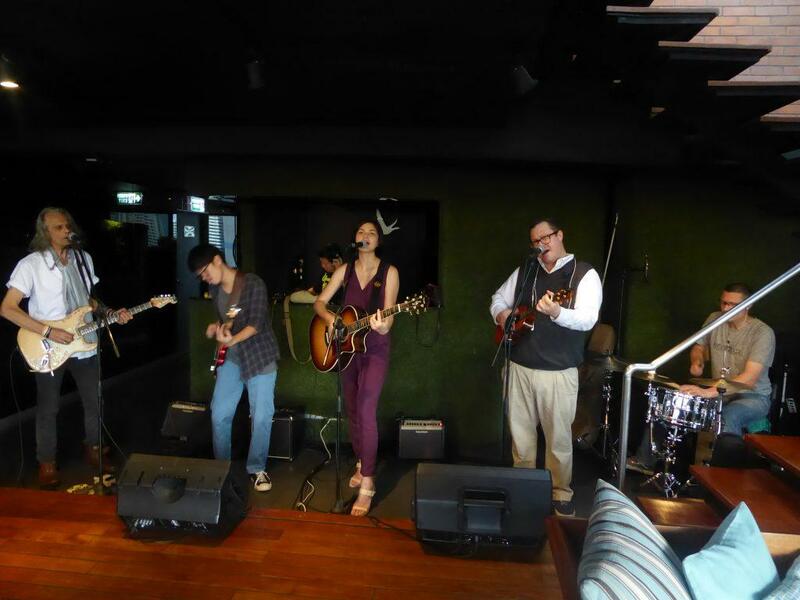 There is live music on Saturdays. 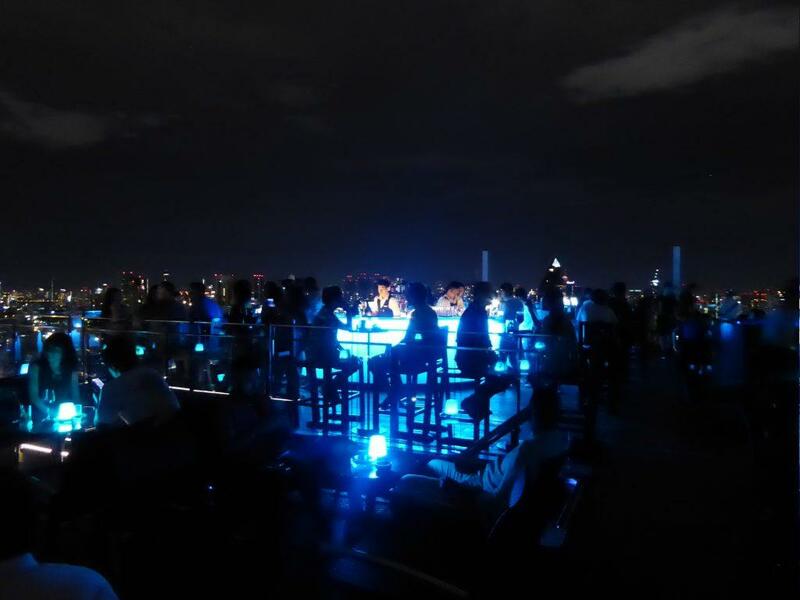 Vanilla Sky is usually not too crowded and is a good place for a quiet relaxing drink while admiring the view of the skyline and chilling out to the DJ. Service is efficient and friendly. 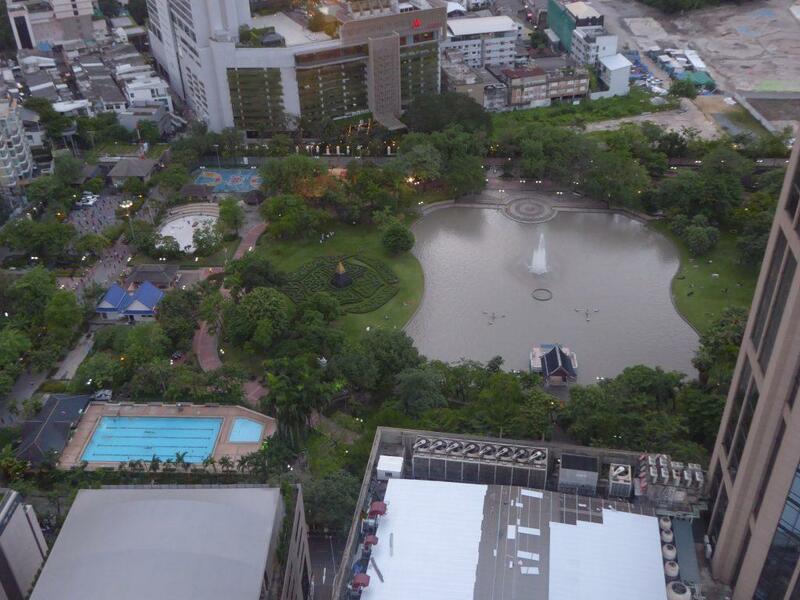 Location: 36th floor, Compass Sky View Hotel, 12 Sukhumvit Road Soi 24, Bangkok. Getting There: BTS Phrom Phong Station (exit 2). 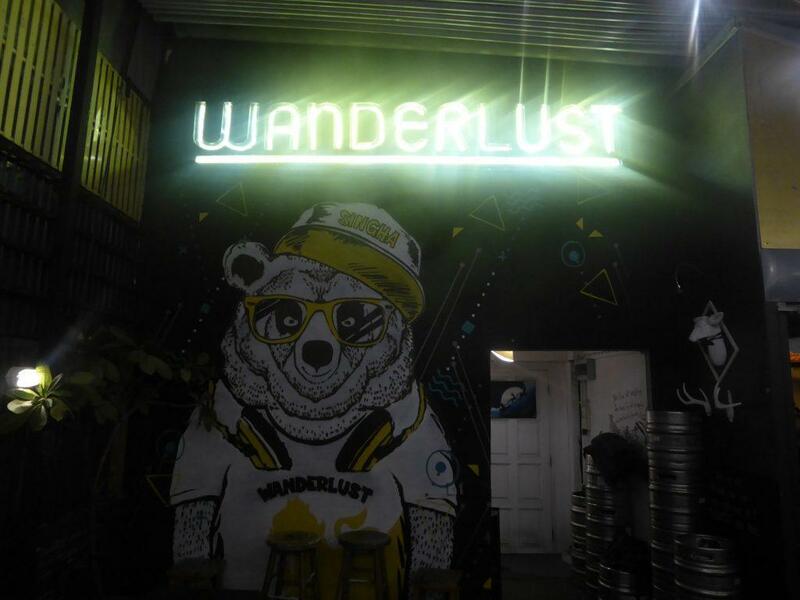 Wanderlust isn’t a bar with stunning rooftop views from a high floor but rather a smallish non-pretentious, relaxing 5th-floor urban neighborhood bar atop a Japanese restaurant and hostel in the Thonglor district. There are no skyline views but rather views of the local neighborhood. The bar has a garden theme with faux grass and wooden tables and chairs. 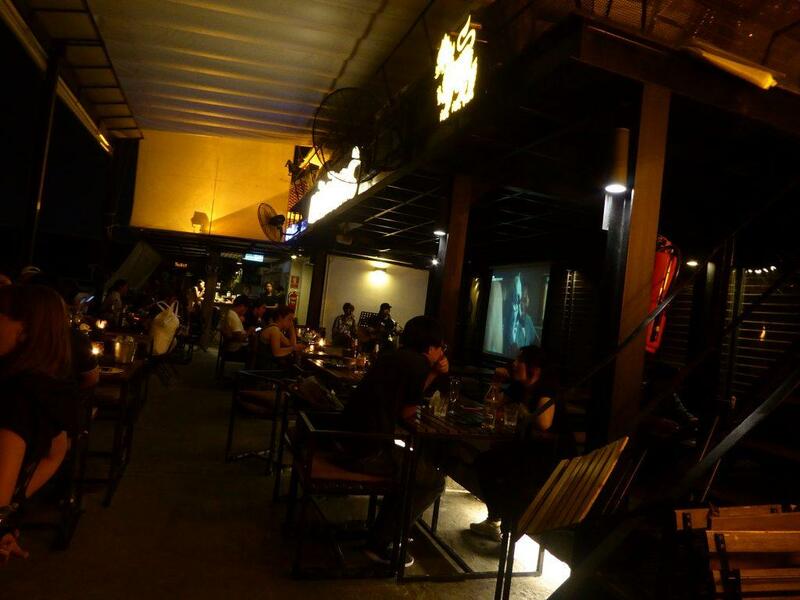 It’s mainly a hangout for locals and expats. 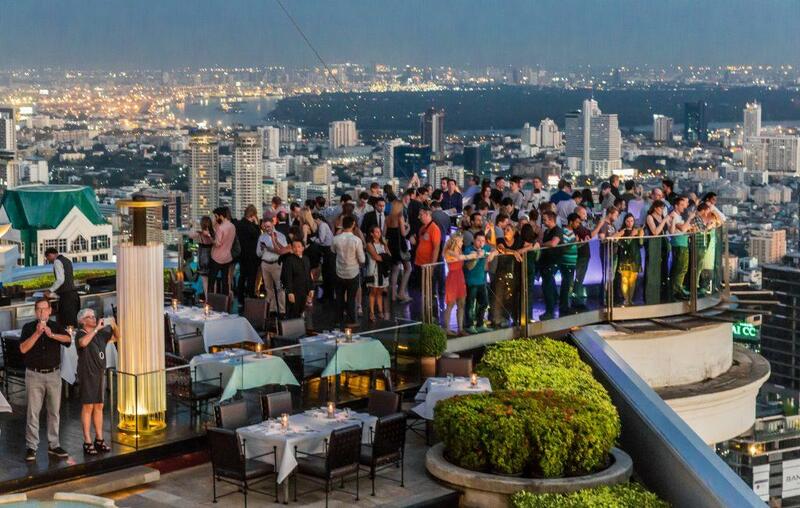 Unlike the more swanky rooftop bars prices are cheap with beers starting at 99 baht, spirits from 169 baht, wine from 150 baht, cocktails from 220 baht and soft drinks from 35 baht. There is a happy hour every day between 18.00-20.00 with 50% off your second drink and draft Singha beer at 100 baht a pint. There is a small fusion food menu with both Thai and western food with prices from 160-300 baht. There is live acoustic music most evenings and live sport on the TV. The bar tends to get busier later at night when it can be difficult to find a table. The bar can be difficult to find. 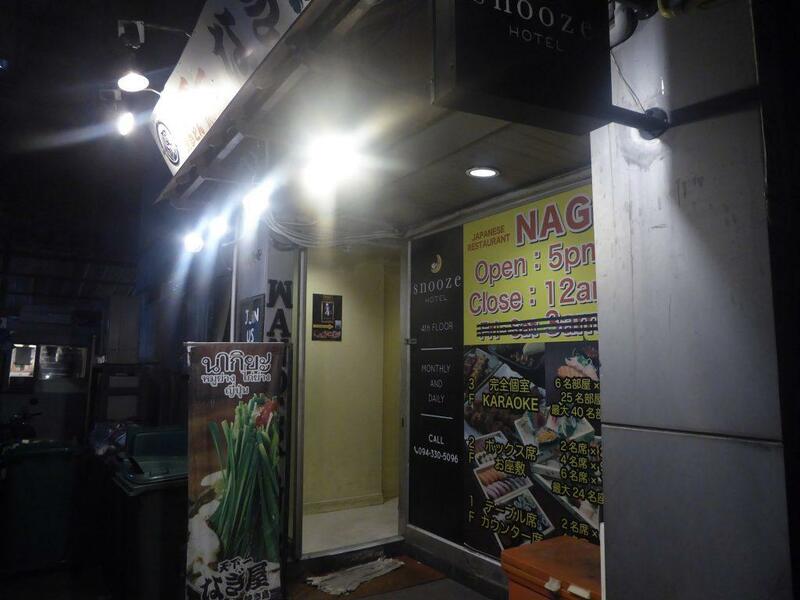 It’s accessible through a side alley on Thonglor Soi 13 above Nagiya Japanese restaurant. Take the stairs or the small lift. Location: 5th floor, Nagiya Restaurant, Soi Akkraphat, Thonglor Soi 13, Bangkok. Getting There: BTS Thong Lo station (exit 3). Turn left into Sukhumvit 55 (Thonglor) and walk for about 15 minutes turning left into Soi 13. Wanderlust is in an alley on the left. Alternatively, take a taxi or motorbike from the BTS. 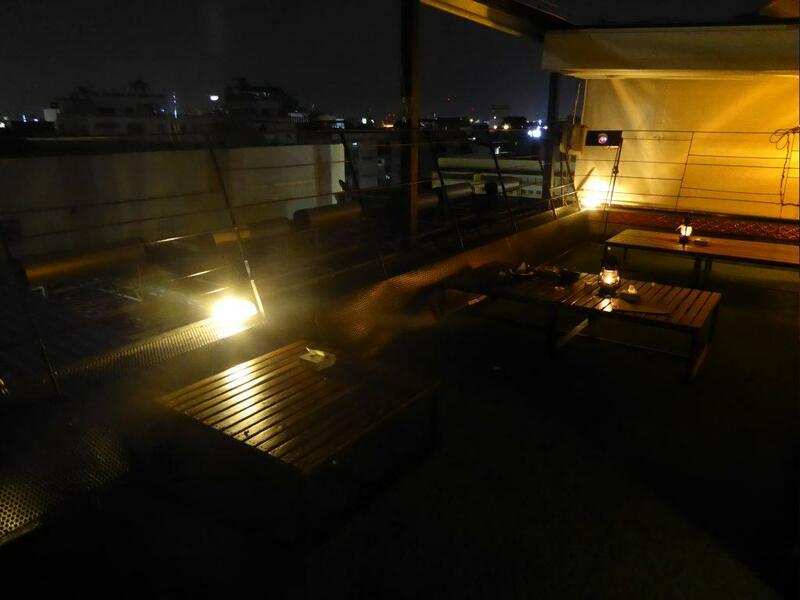 Jham Jun is a small rooftop bar on the 5th floor of the Jam Hostel on Phra Sumen Road in Banglamphu. Access is by elevator from the 1st floor. 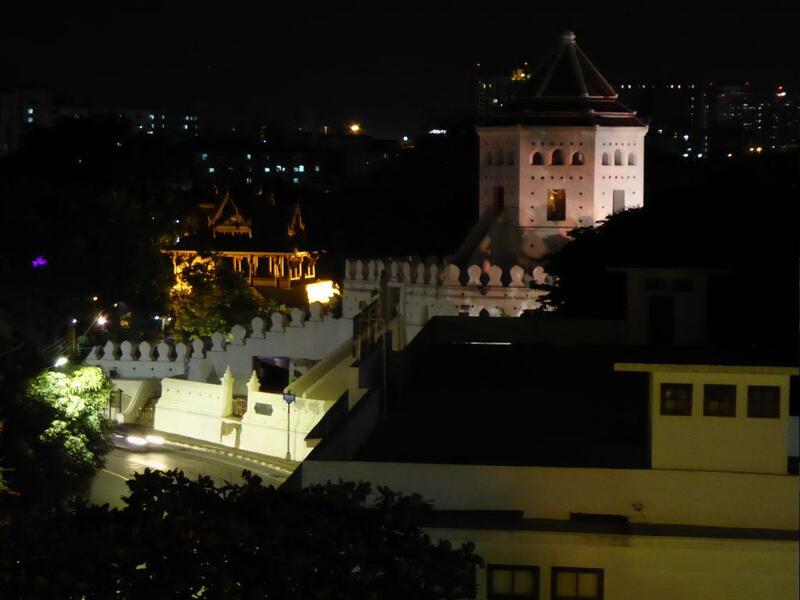 The bar has good views overlooking Phra Sumen Fort and the riverside Santi Chai Prakan Park. The bar is spread over two levels with the lower level containing the bar, balcony table, and chair seating and a raised area with low tables and cushioned seating. The upper level is dark and quieter with cushion seated low tables lit by kerosene lamps. 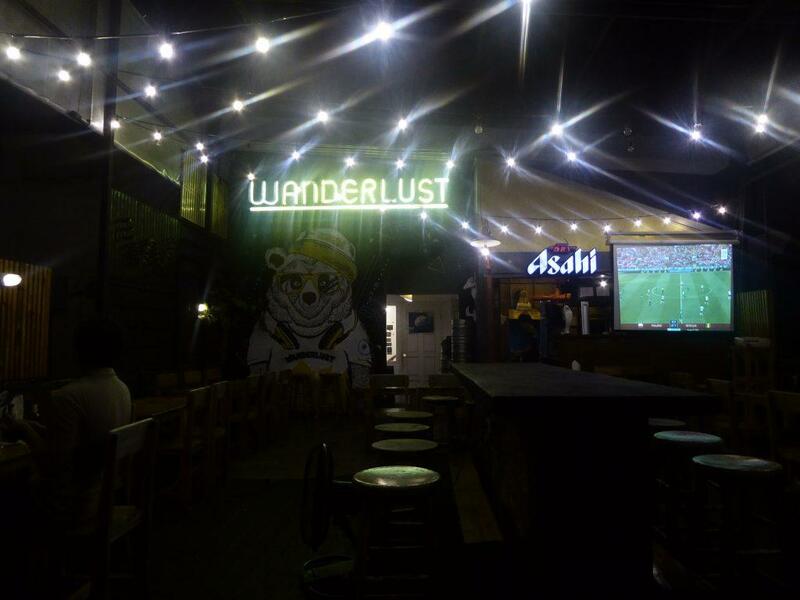 The menu is Thai fusion with food and beers both starting at 100 baht. 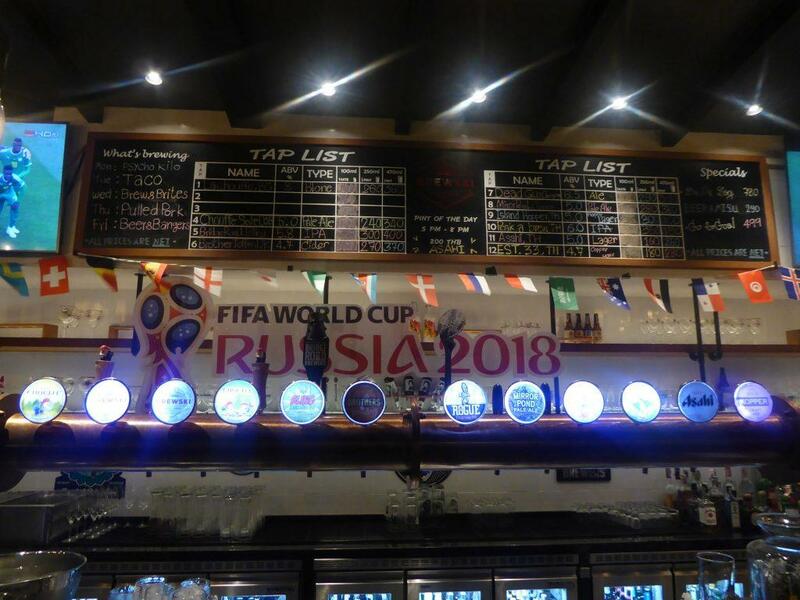 There is live acoustic music from 21.00 and live football is shown on a large screen. The clientele is mostly young Thais and a few travelers in a relaxed atmosphere away from the tourist crowd. Location: 9 Phra Sumen Road, Banglamphu, Bangkok. 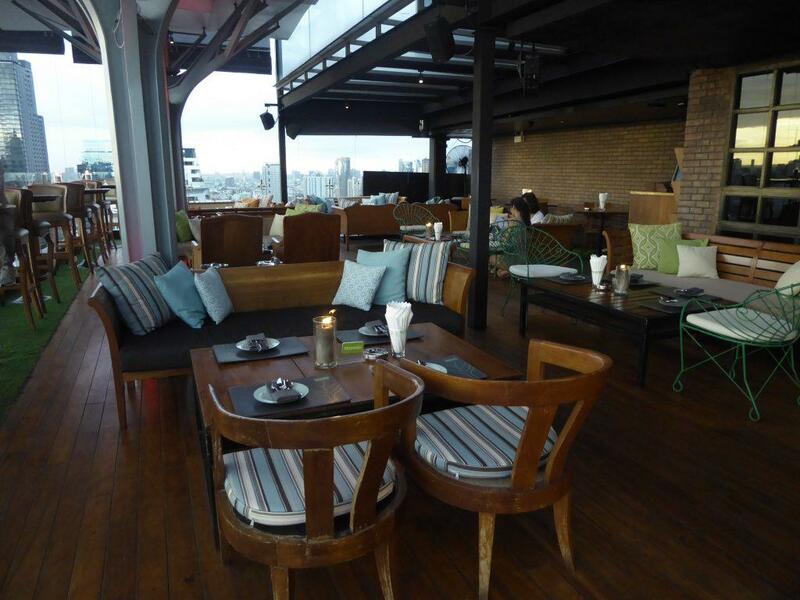 At-mosphere is a rooftop cafe bar just around the corner from Khaosan Road. 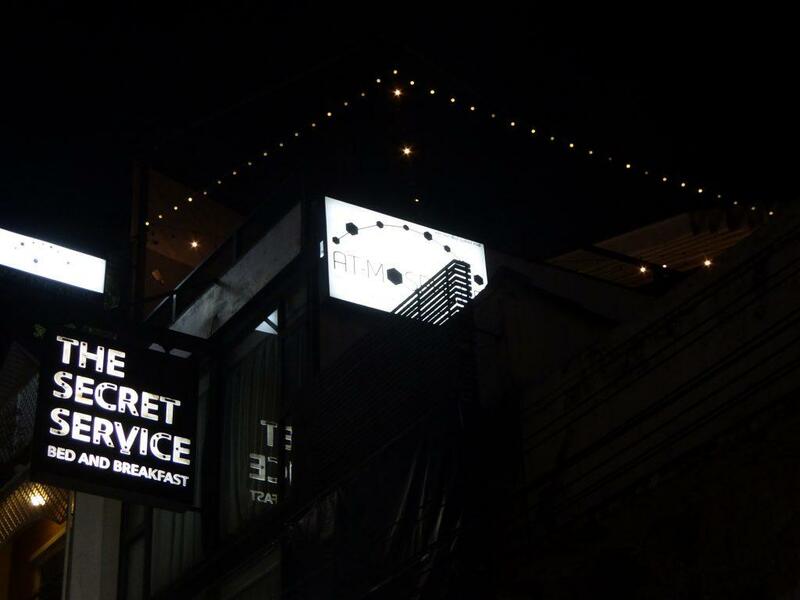 It’s on the top floor of the building housing the Secret Service Hostel on Soi Tani. 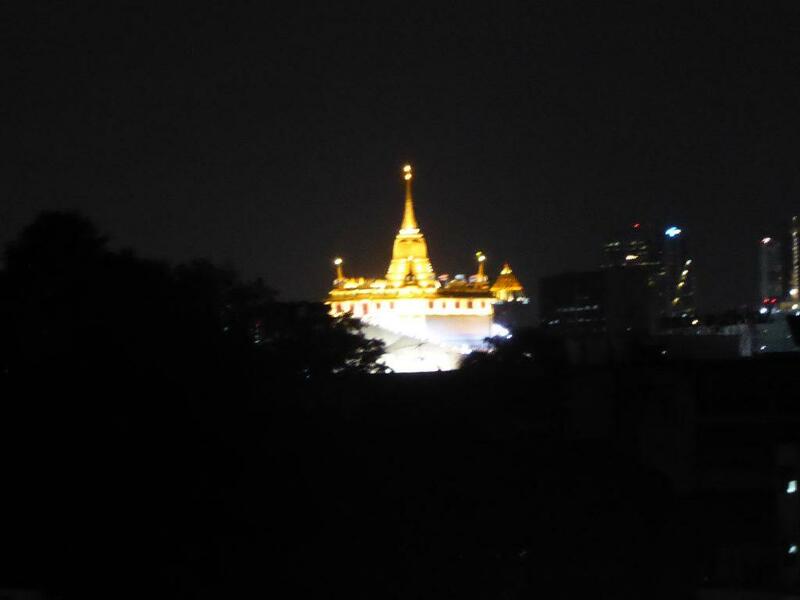 The view is average for a rooftop bar but you get a good view of Wat Bowonniwet Vihara before it gets dark and Wat Saket is visible in the distance. The bar serves a good selection of food and drink though prices are slightly above average for Khaosan Road. Beers start at 100 baht for a small Singha and bottled craft beer is available. Foodwise, the mains are 200-300 baht. There is live acoustic music from 21.00. The crowd is a mixture of local Thais and travelers. The bar has a nice ambiance and is a good place for a sundowner. Location: 113/1 Soi Tani, Banglamphu, Bangkok. (Above Secret Service Bed & Breakfast). Getting There: A short walk from the Swenson’s end of Rambuttri Road.